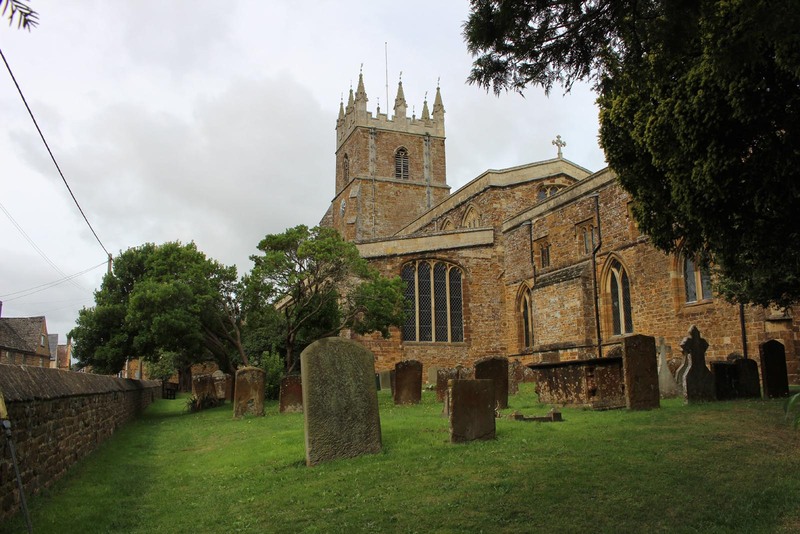 St. Peter and St. Paul Church is in the civil parish of Deddington, about 6 miles south of Banbury. From Banbury, on reaching the village, turn left at the lights, then bear right into Market Place where there is free parking. 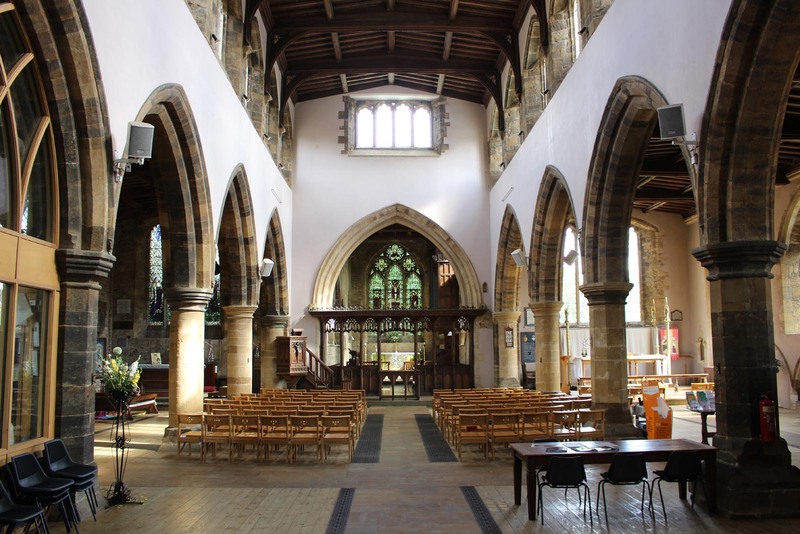 This is a very spacious church with a chapel either side of the nave. Windows high above the nave fill the church with light. The church is open daily. This is a very active church and you may find it busy at times. Their website has details of the services . 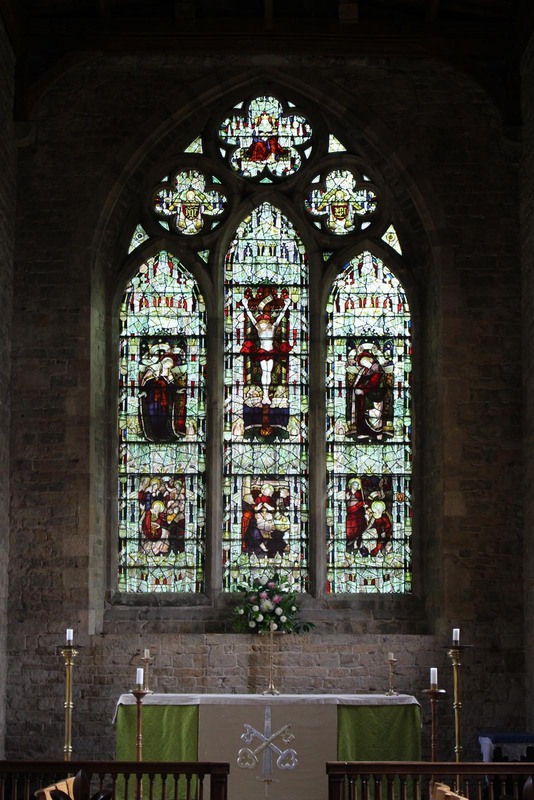 There has been a church here since Norman times, but the present church first appeared in records in 1254. 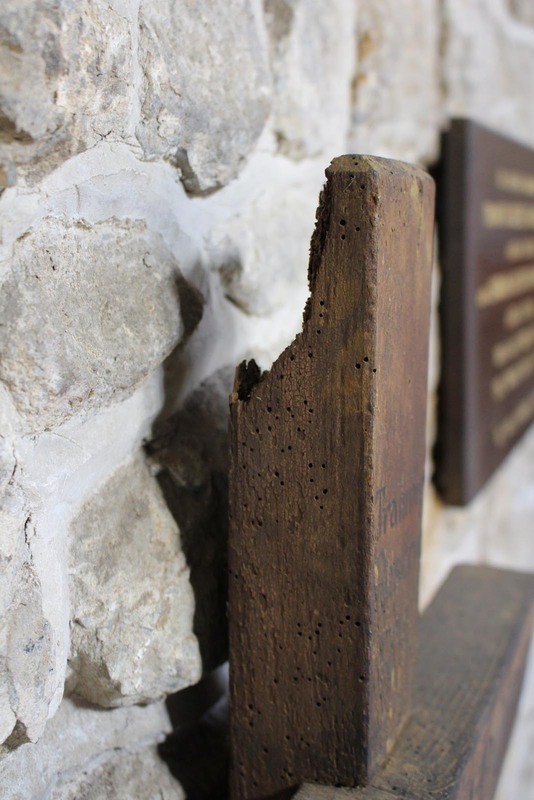 In 1634 the tower and spire fell down causing considerable damage. King Charles I had the bells melted down to make cannons in the Civil War. 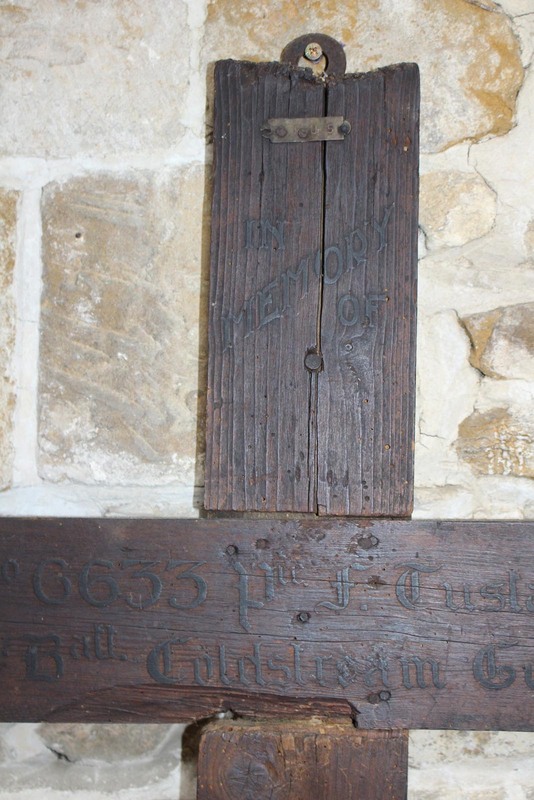 The six bells were not replaced until 1791. The church was rebuilt with a massive buttressed tower with eight weather vanes and no spire. 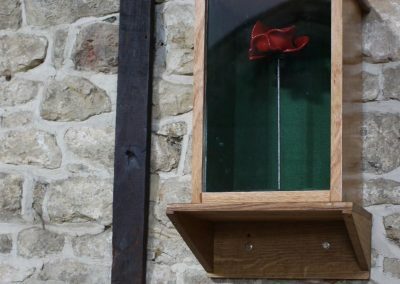 Two additional bells were added to the tower post WW2 to commemorate the Deddington Home Guard. 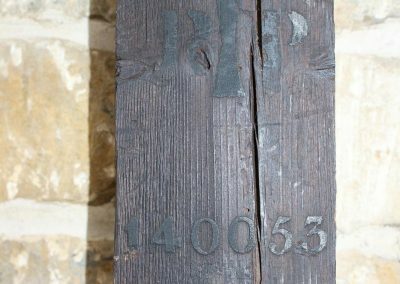 There are nine wooden grave crosses mounted on the wall either side of a porch dating from the 15th century, which is opposite the main entrance. 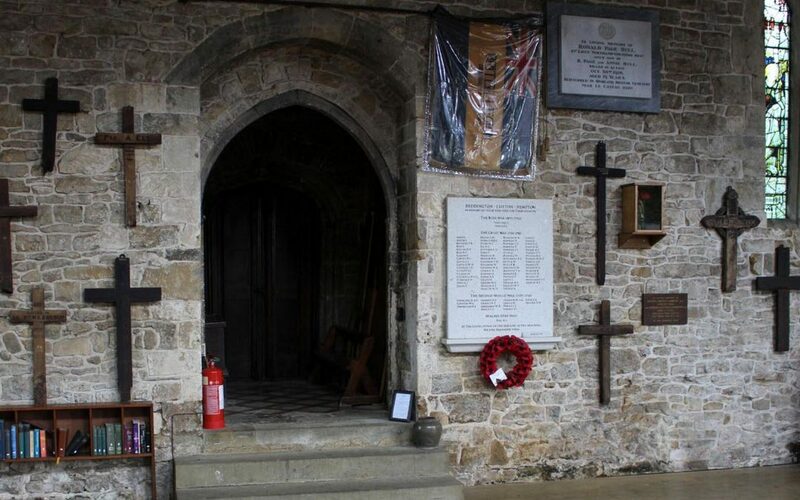 Just inside the 15th century porch is a WW1 memorial plaque. 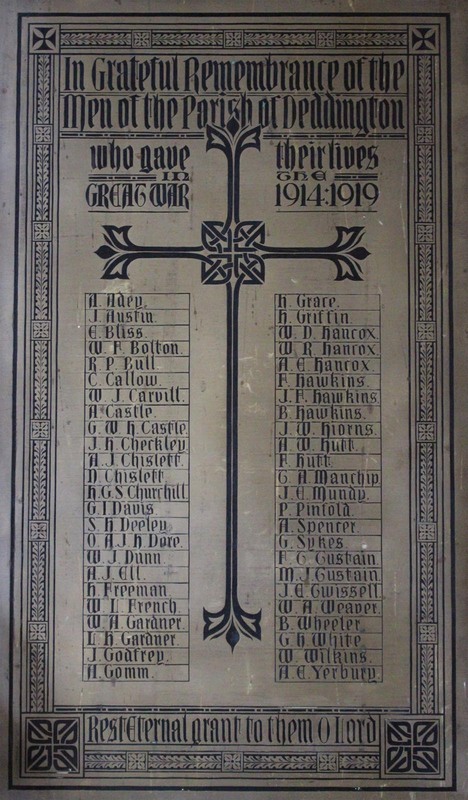 A modern marble plaque is mounted between the crosses, this includes additional names not included on the original WW1 memorials and additional names from the Boer War, WW2 and later conflicts. 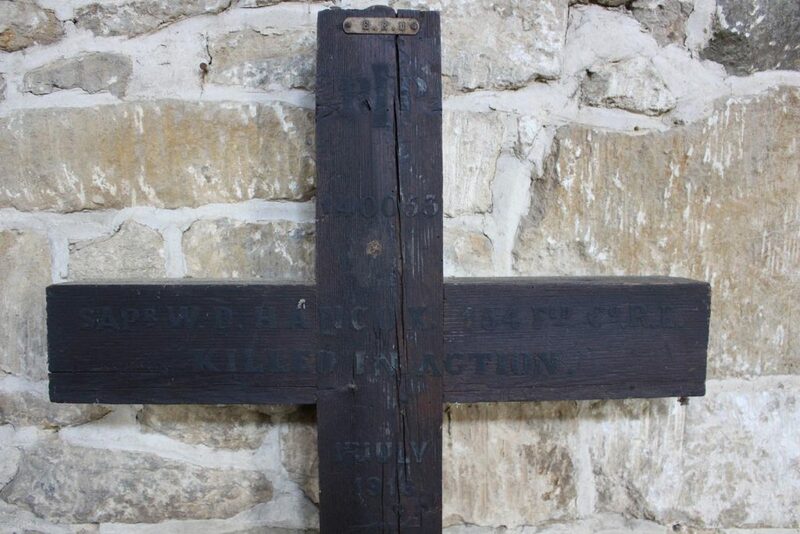 Four of the nine crosses are true battlefield crosses returned from the front, the other five were used as grave markers in the churchyard for WW1 soldiers who died at home and were buried there. Those five graves are now marked with standard pattern CWGC Portland headstones. 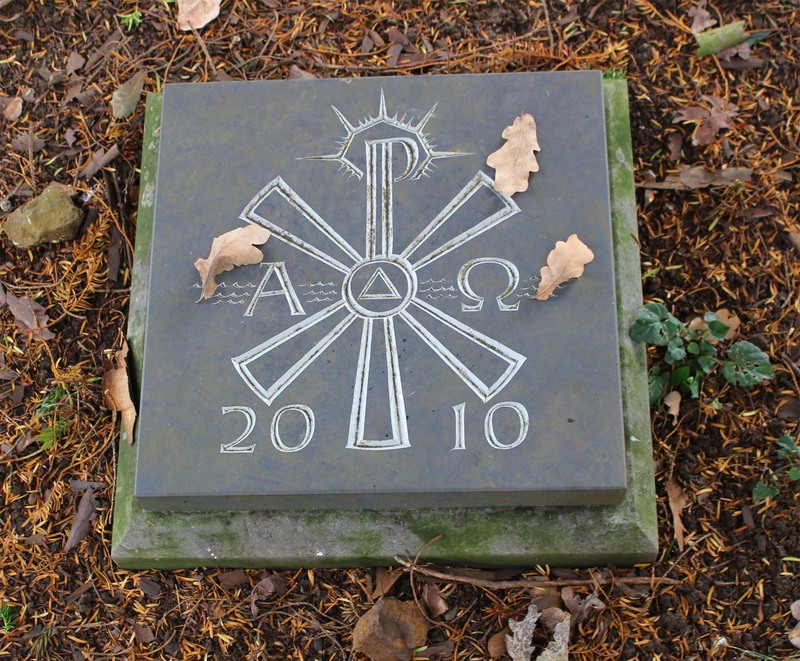 These can be found at the New Churchyard to the east of the church. 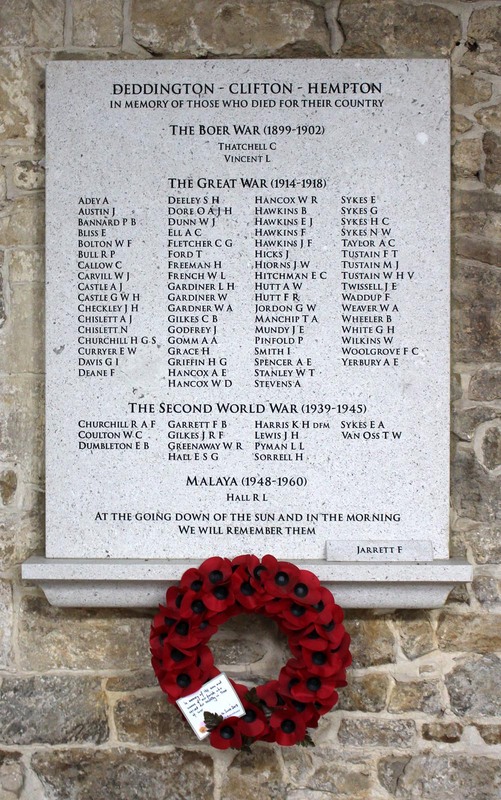 Also in this burial ground is a Portland stone war memorial dating from post WW1 to which WW2 and later names have been added. 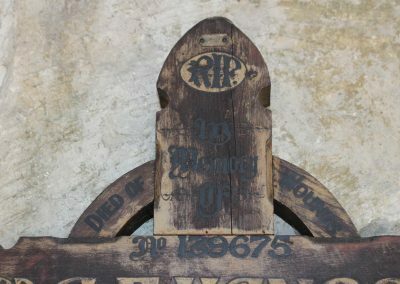 The church has a very detailed website www.deddingtonchurch.org with lots of local history. 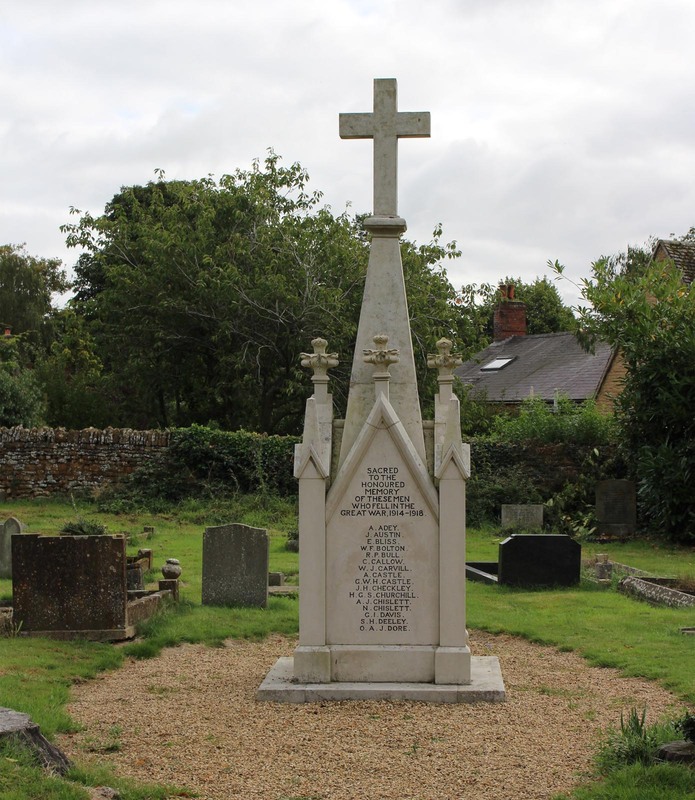 Also to be found there is a PDF copy of research on the war memorials, originally published as A Parish at War by Michael Allbrook and Robert Forsyth in 2011. 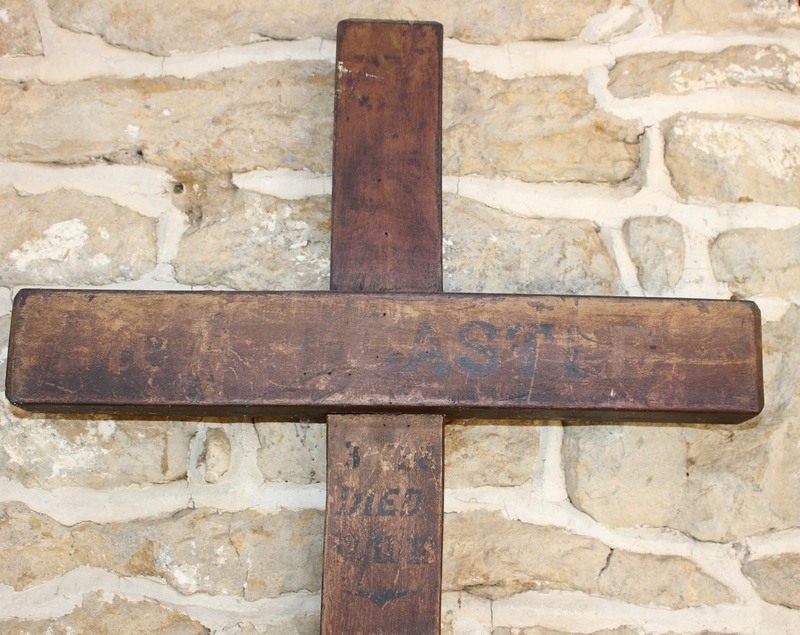 The four battlefield crosses are named to R. P. Bull, A. E. Hancox, W. D. Hancox and F. Tustain. 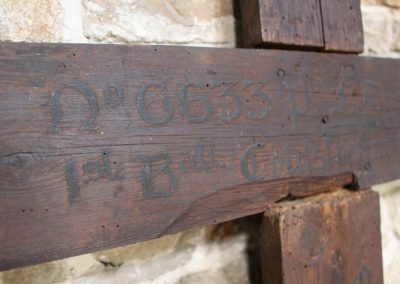 Despite the abundant light in the chapel, most are difficult to read as they appear to be stained black with black text. 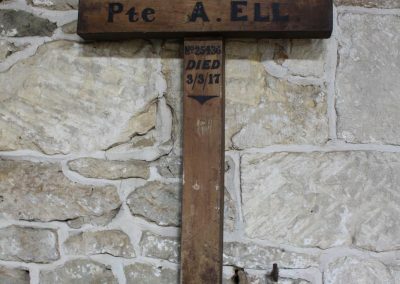 A marble memorial to Second Lieutenant Bull, is mounted on the wall above the battlefield crosses. 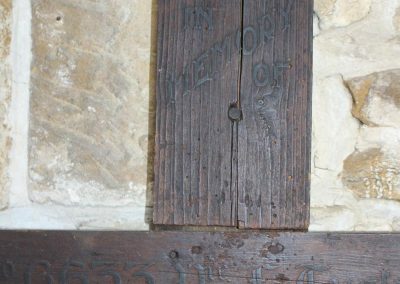 There is an oak panel memorial to the three Hancox brothers high on the wall to your right as you approach the ringing chamber, below the tower. Ancestry, Archive Research and Document Copying ( www.arcre.com ), CWGC, The National Archive, A Parish at War. Text type: Four GRU tags only. 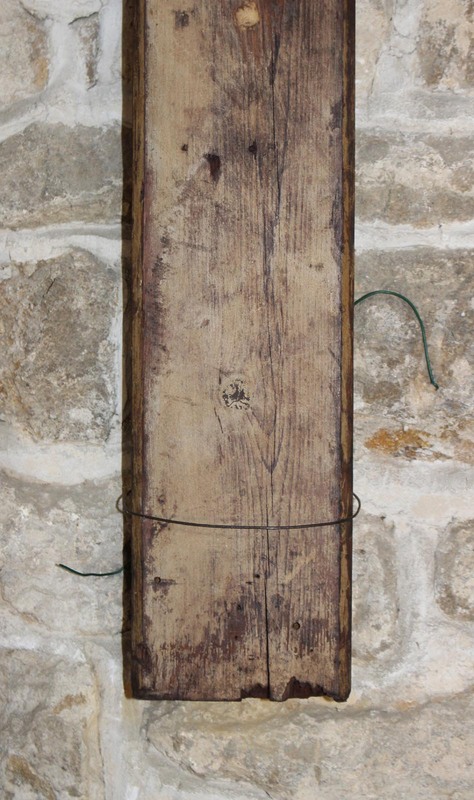 Mounting : Hanging on wall. Wire loop attached (to attach wreath). Detailing: Rough sawn edges to timber. Tapered shaft base. Nailed half lap joint not flush. Evidence of use in field : Light staining of base from ground. Finish : Black stained. Possibly a preservative finish added later. 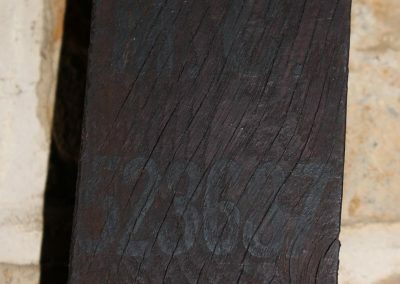 Some staining to GRU tags. Condition : Slight splitting. 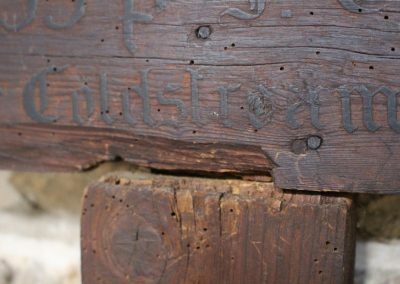 Trace of woodworm. 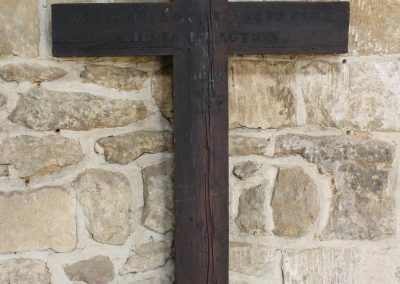 A grey and white marble memorial plaque, give by the Bull family, is mounted on the wall above the cross. 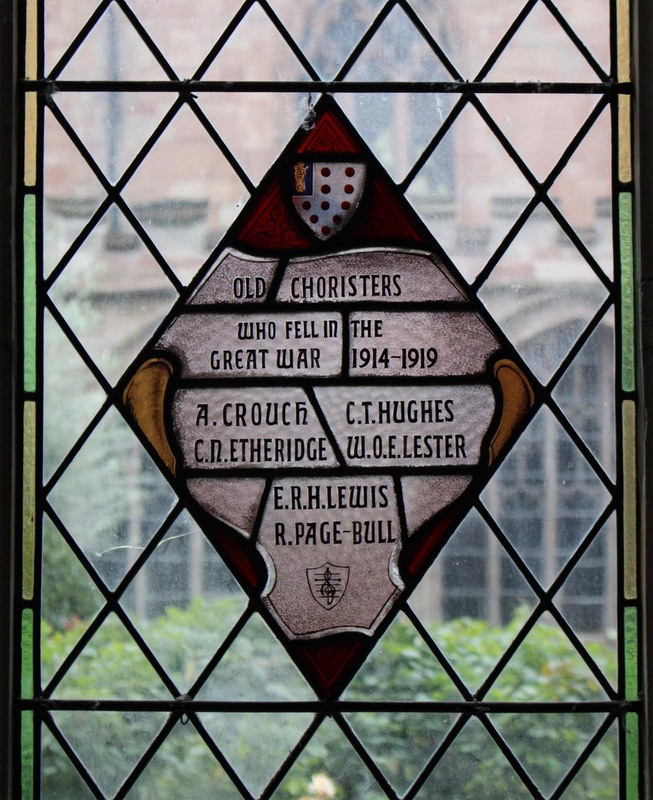 P. Bull is commemorated on the stained glass window in the Cloisters at Worcester Cathedral’s Choir School memorial. His name there is given as R. Page-Bull, which is not seen elsewhere. Page seems to be a given name, also of father and his three sisters. Living at New Street, Deddington with parents Richard and Annie and sisters Frances, Maria and Vera. Father’s occupation is Veterinary Surgeon. 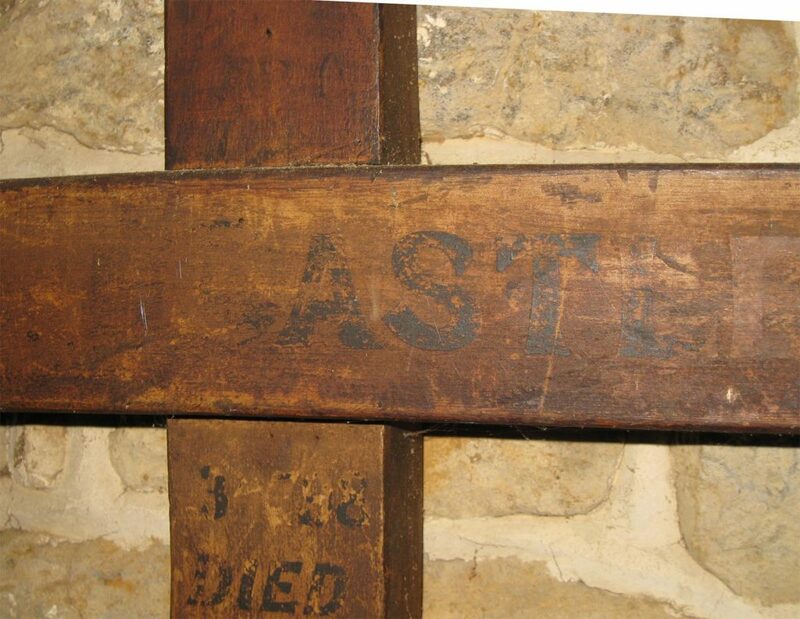 A border at Worcester Cathedral Choir School, age 12. Ronald Page Bull. 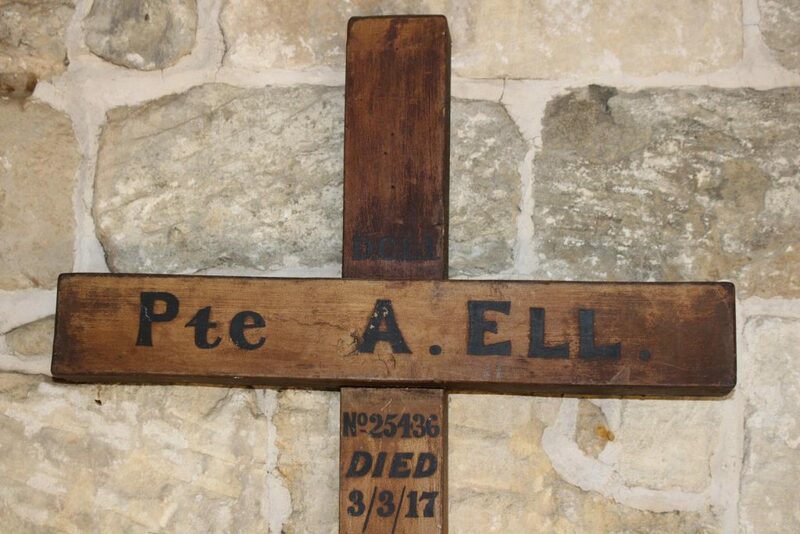 Second Lieutenant, 4th Battalion Northamptonshire Regiment. Age 19. 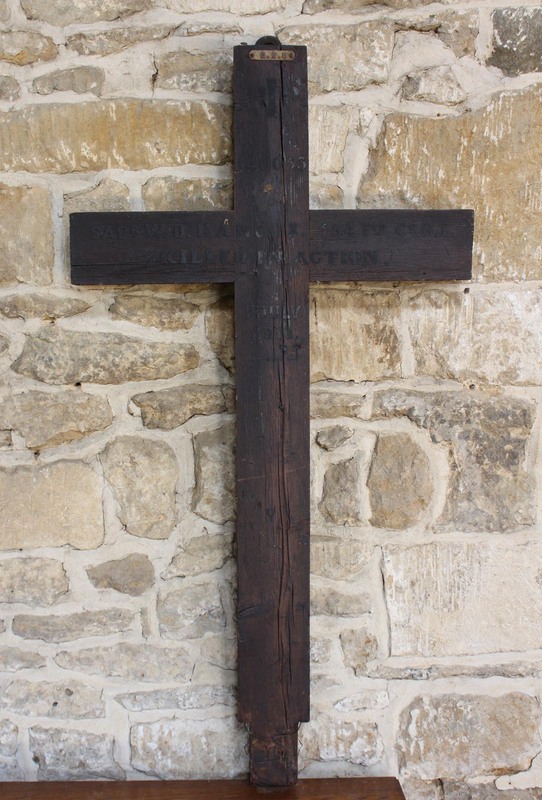 Buried at Highland Cemetery, Le Cateau, grave number XII.A. 9. Exhumed from map reference R.33.c.1.2. in 1920. 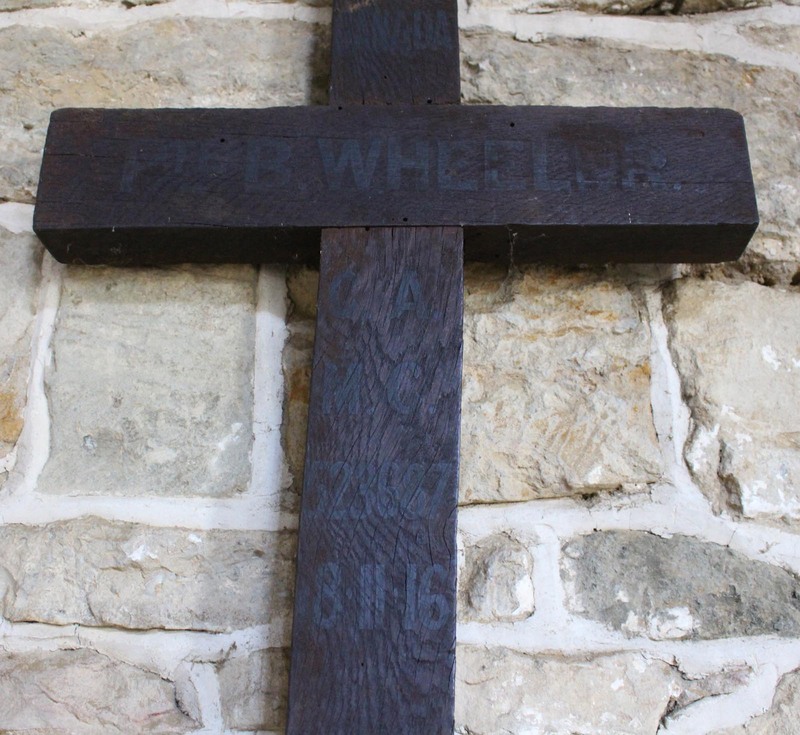 Date of death given as 30th October 1918 (battlefield cross records the date 1/11/18, the 1st. Northants. 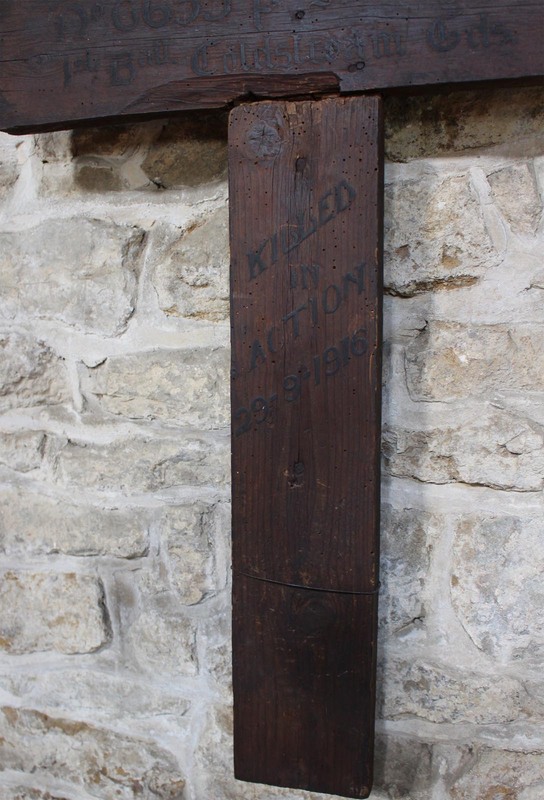 war diary reports killed in action 29/30th October, while the battalion were in action). 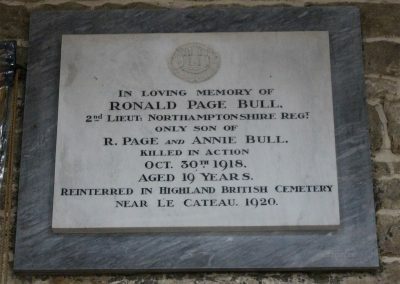 Only son of Richard Page Bull and Annie Bull, of Deddington, Oxford. Born 13th March 1899 at Deddington. Attended Boys High School, Oxford and Worcester Choir School. Enlisted 9th February 1917 as 30416 Pte., Age 18 yrs. 6 months, height 5 ft 11 1/4, weight 142lbs. Occupation Veterinary Student. 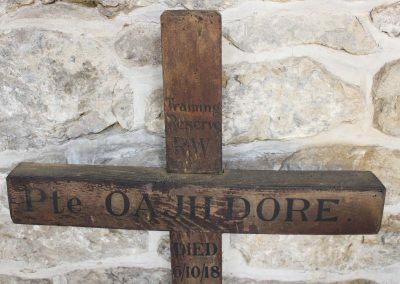 Mobilised and attached to OBLI 4th October 1917. Trained at Durham University OTC, cadet No 2390. Discharged to Commission as 2/Lt. With 4th Northamptonshire Regiment, 26th February 1918. Disposition of the battalion: A coy left coy. B coy centre coy. C coy. right coy. D coy support. During the day the battalion endeavoured to reach the line of the CANAL DE LA SAMBER A L’OISE by peaceful penetration. The right company reached the canal without opposition but the centre company met with strong opposition from machine guns and snipers. At 8.00 the centre coy attacked under a barrage and gained all it’s objectives except a strong point on the right flank by 8.25. 15 prisoners + several M.Gs were captured in this attack. Prisoners were of the 78. R. I. R.
at 14.15 the centre coy. again attacked. and gained all its objectives by 14.30.
at 16.55. the Boche counter attacked in strength and pushed the right of the left company and also the left of the centre company. at 5.03. the Boche again counter attacked in force and pushed back the right flank slightly. The enemy attacked in two parties, one party attacked the left coy. from the direction of CATILLON. and the other crossed the canal by a bridge by the barge and attacked the right of the centre company. at 12.00 the left and centre companies again attacked under a creeping barrage (100 yds in 4 minutes) but were again held up by M.G. fire from the strong point on the right flank. 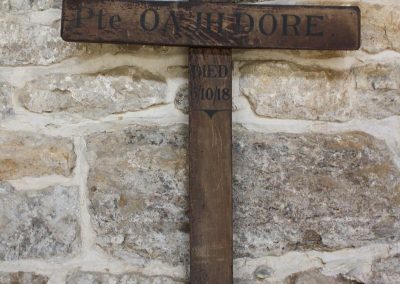 all objectives were gained by 16.20 and at 19.00 the battalion was relieved by the 1st Bn, the Gloucestershire Rgt on the line of the canal. The left company had formed a defensive flank SOUTH of CATILLON. The battalion marched out to VAUX ANDIGNY through MAZINGHIEN, L’ARBRE de GUISE and MOLAIN. 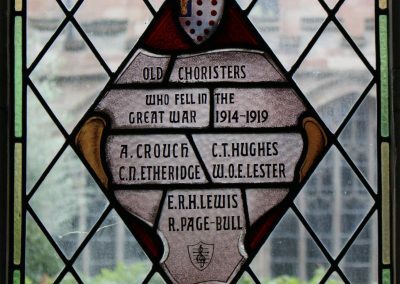 DIED OF – WOUNDS – JULY 24 – 1917. Mounting: Fixed to wall. 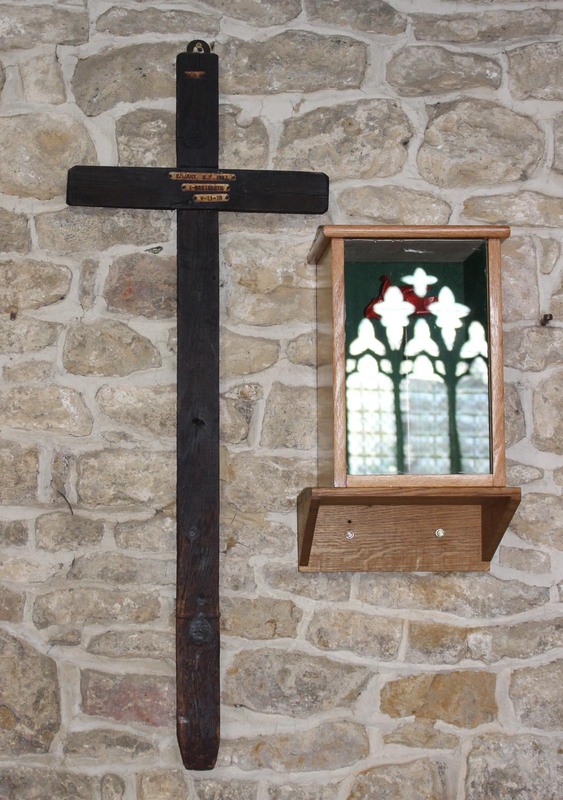 Unused metal loop on top of cross. Wire loop attached (to attach wreath). Detailing: Celtic cross with carved ends. 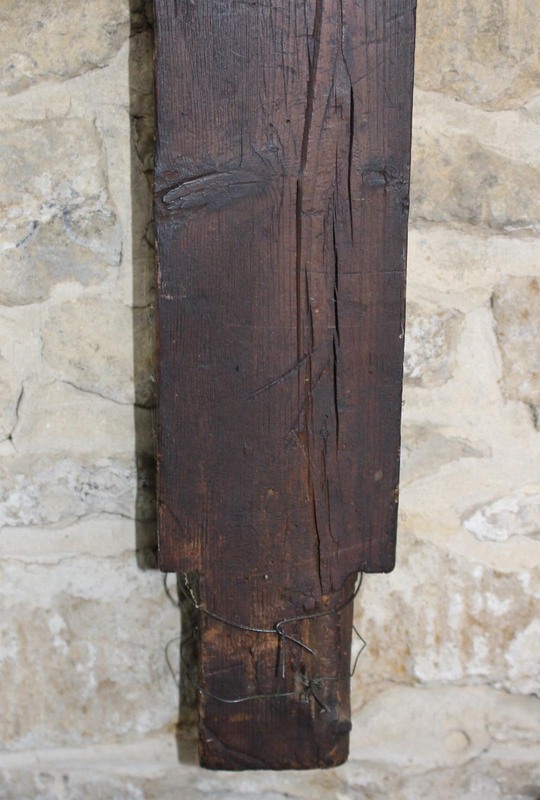 Evidence of use in field : Paint weathered back to bare wood. Surface insertion depth: No marking, possibly broken off at ground level. Finish : White/ pale painted. 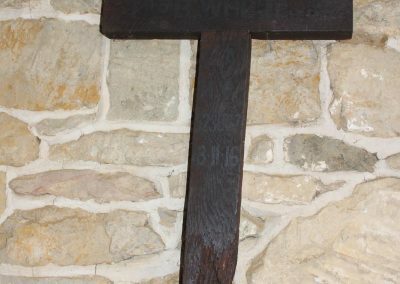 A gilded oak plaque, commemorating the three Hancox brothers, is mounted on the north wall in the west end of the church. 27th July: “Informed by No 11 CCS Spr. 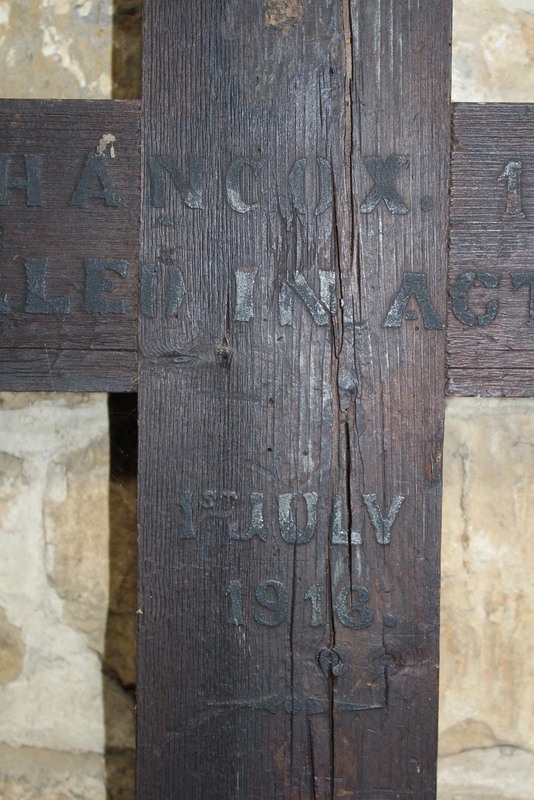 Hancox died of injuries from ??? explosion by a shell.”. 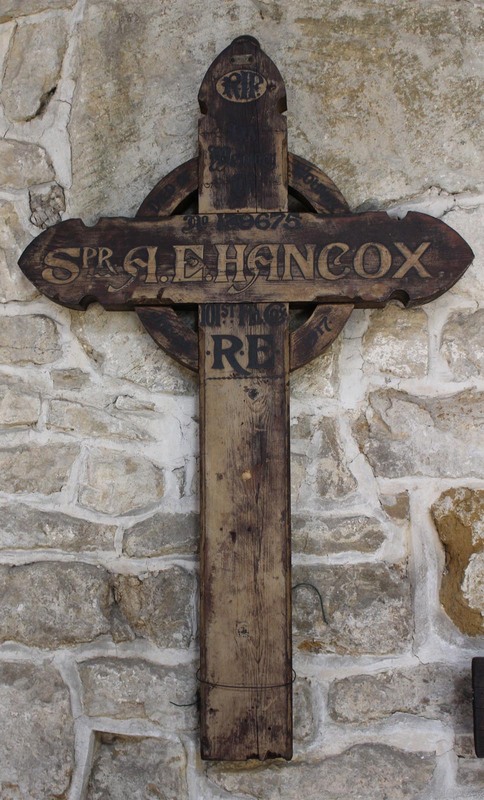 Sapper Hancox is buried in Godewaersvelde British Cemetery, south west of Poperinge, which was used by the 11th CCS for burials from July 1917. 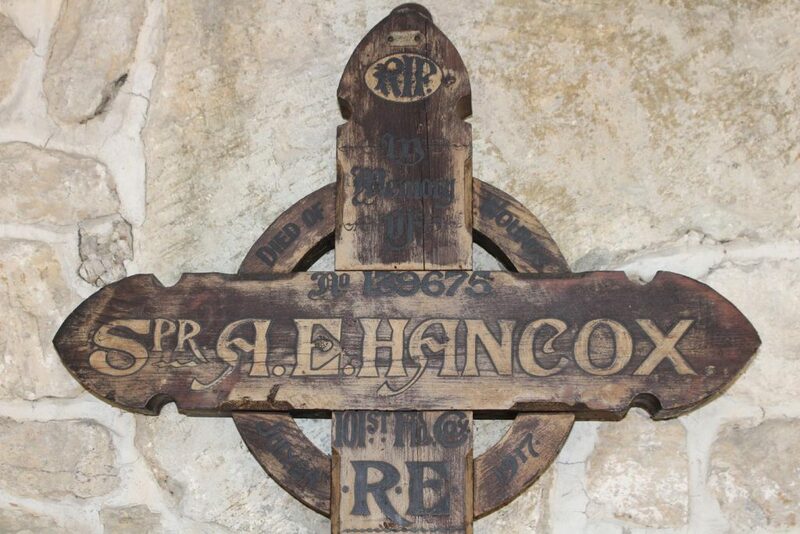 Sapper 139675 Hancox, Albert Edward. Royal Engineers, 101st Field Coy. Buried at GODEWAERSVELDE BRITISH CEMETERY. Grave Reference: I. A. 4. 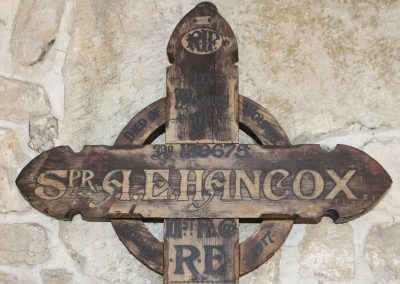 Son of David and Ellen Hancox, of Grove Lodge, Deddington, Oxford. 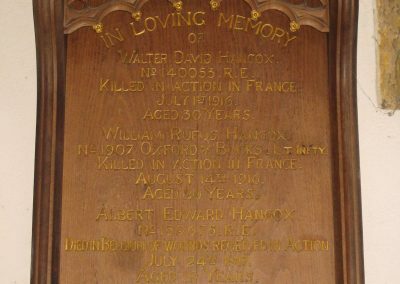 His brothers Walter David Hancox and William Rufus Hancox also fell. 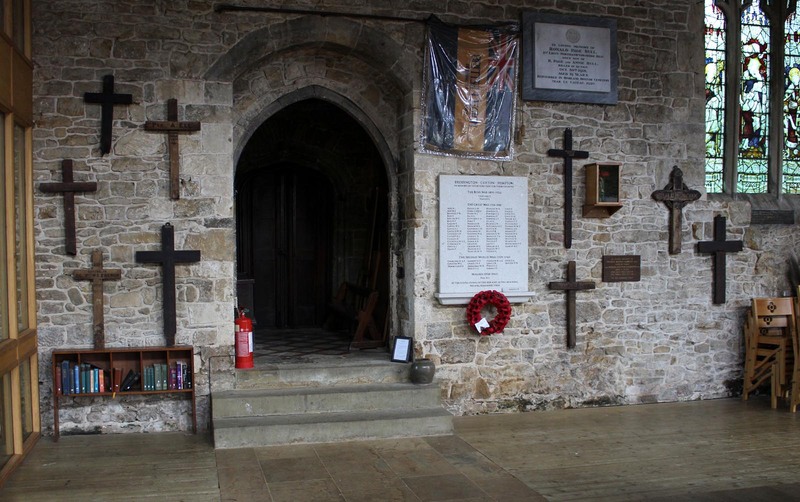 See the battlefield cross for Walter David, also located in this church. Corporal 1907 Hancox, William Rufus. 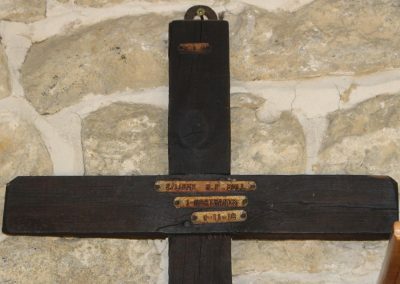 1st/4th Oxford and Bucks Light Infantry, was killed in action 14th August 1916, Age 20. Commemorated on The Thiepval Memorial. Born Deddington, Oxon. Enlisted Banbury, Oxon. Residence Deddington, Oxon. In 1901 and 1911, Living at New Street, Deddington with parents and two brothers Walter David and William Rufus. SAPr. W. D.HANCOX. 154 Fld CO. R.E. Text type : Small GRU tag embossed “G. R. U.” at top. Hand painted black text. Mounting: Fixed to wall. Wire loop attached (to attach wreath). 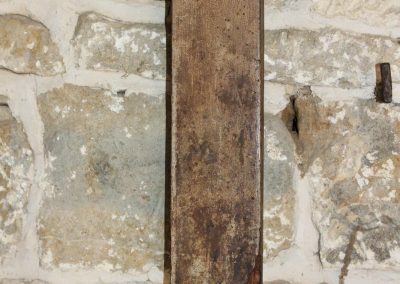 Detailing: Tenon on shaft base, suggests once fixed to some structure. 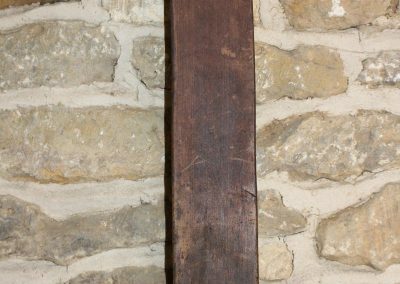 Condition : Some splitting to shaft. 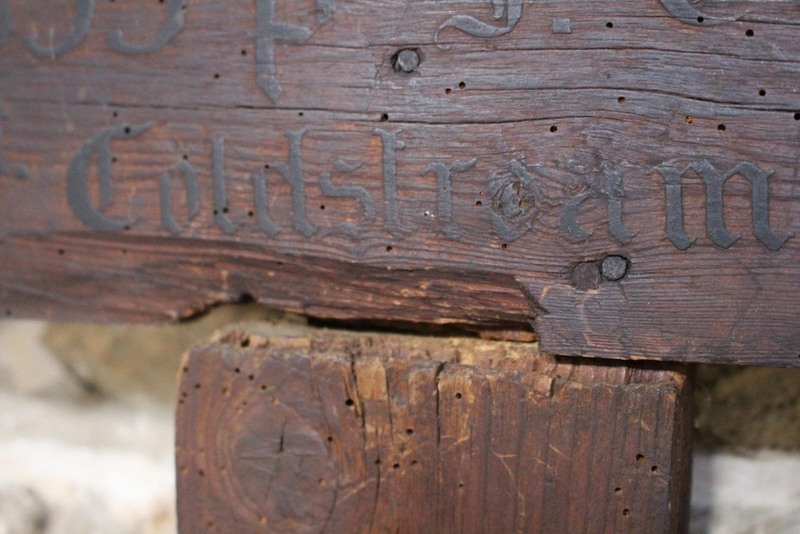 Traces of woodworm. 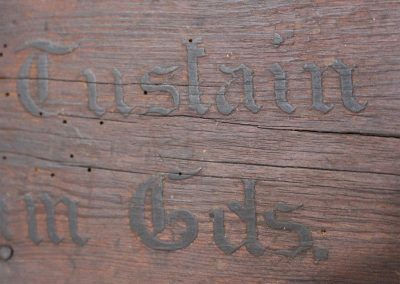 , Painted text, which is raised slightly giving an ‘intaglio’ effect. Possibly stained after recovery. 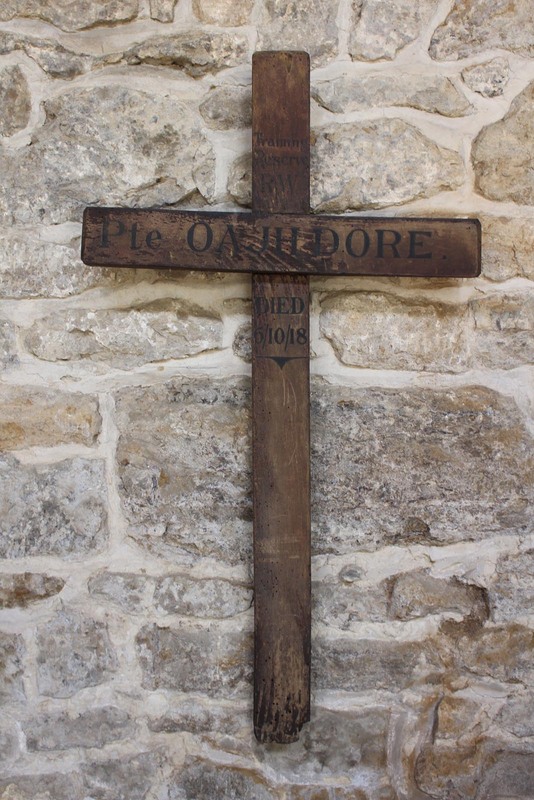 The cross of Pte. 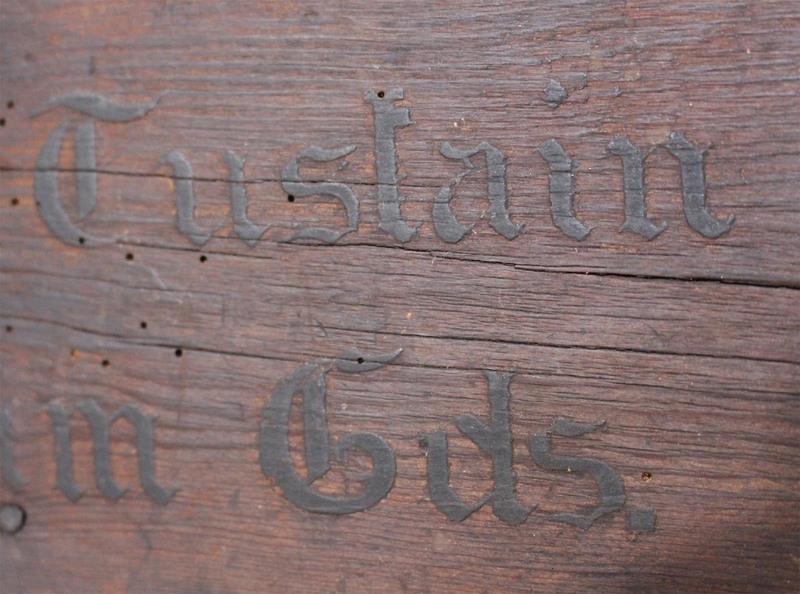 Tustain, from another source is in a similar condition. 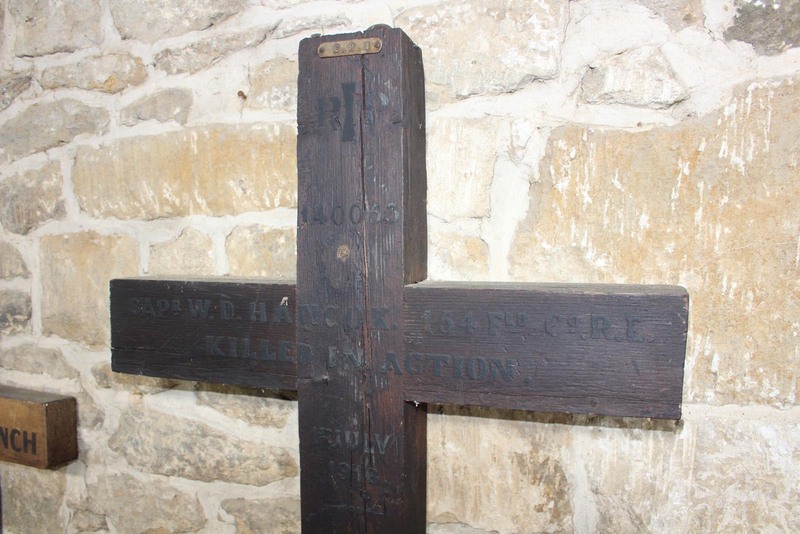 140053 Sapper Hancox, Walter David. 154th Field Coy. Royal Engineers. 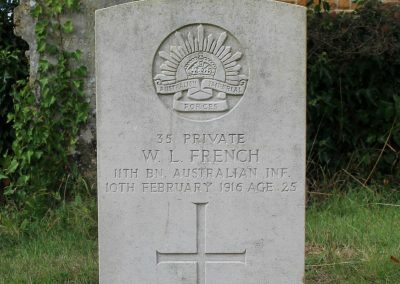 Buried at BIENVILLERS MILITARY CEMETERY. Grave reference: VIII. B. 13. 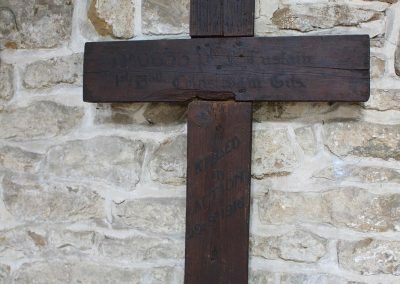 Son of David and Ellen Hancox, of Grove Lodge, Deddington, Oxford. 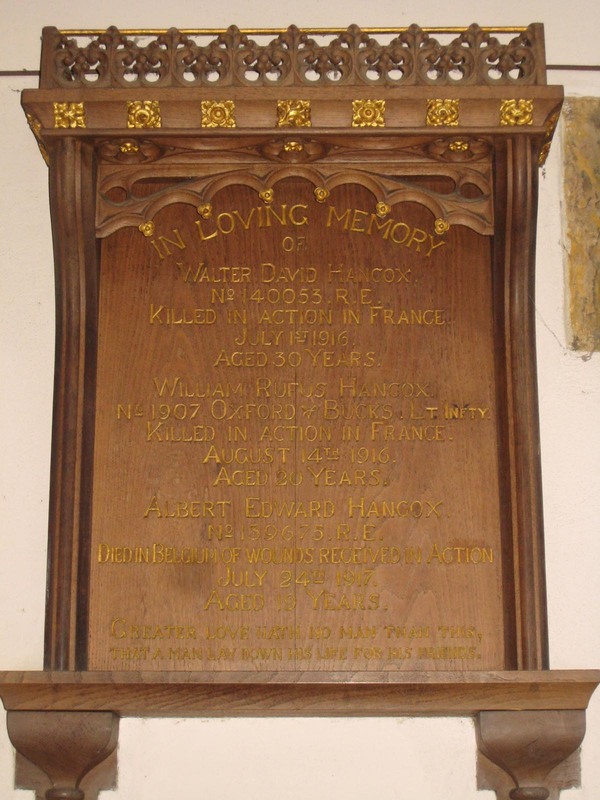 His brothers Albert Edward Hancox and William Rufus Hancox also fell. 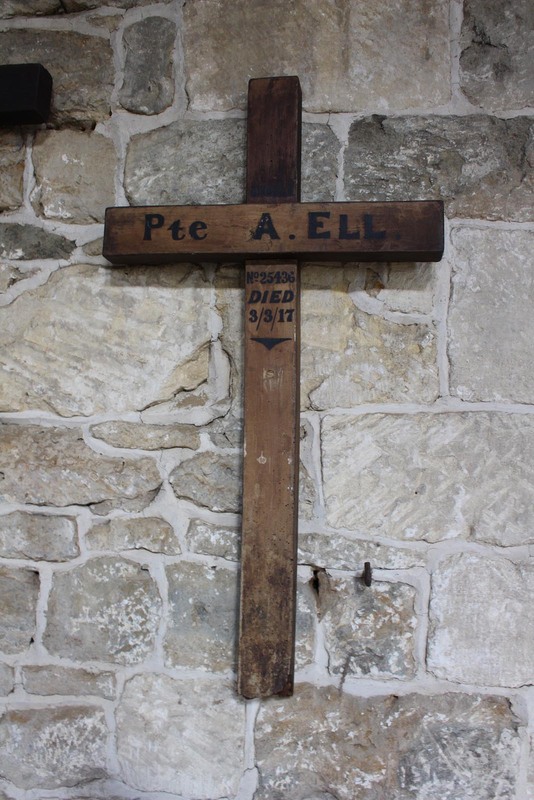 See the battlefield cross for Albert Edward, also located in this church. Corporal 1907 Hancox, William Rufus. 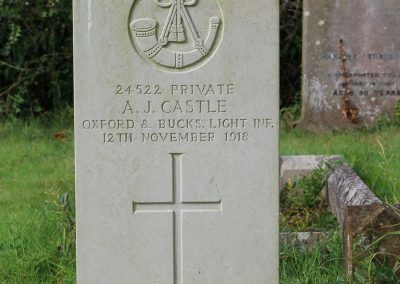 1st/4th Oxford and Bucks Light Infantry, was killed in action 14th August 1916, Age 20. 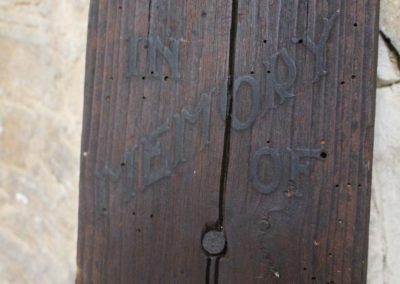 Commemorated on the Thiepval Memorial. 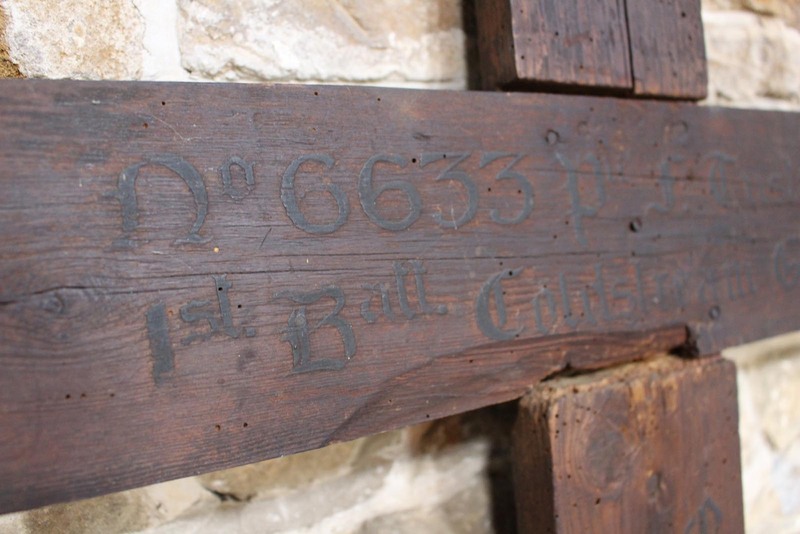 In 1901 ans 1911, living at New Street, Deddington with parents and two brothers Walter David and William Rufus. All Company standing by at BIENVILLERS [ed- 3km north west of Gommecourt]. Mounted section in bivouac at POMMIERS. About 6.30 a.m. whilst the Company was changing position from the camp on to the sunken BERLES road, two 5.9 shells fell amongst them, killing 15 and wounding 17. One died of wounds afterwards. All these casualties except one occurred in Nos 3 & 4 Sections and put them practically out of action for the time being. 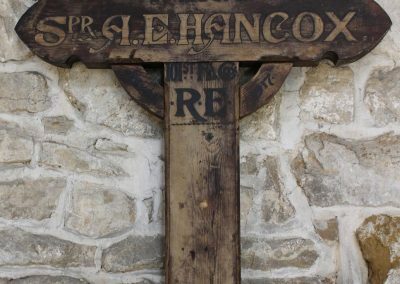 D. Hancox was a bell ringer at Deddington, a member of the Oxford Diocesan Bell Ringers society. He is commemorated in the Memorial Book on display on the way up to the ringing chamber of St. Paul’s Cathedral, London. Text type: Small GRU tag: “G. R. U. 5”. Main inscription hand written, black text. Nice ‘Blackletter’ style font. 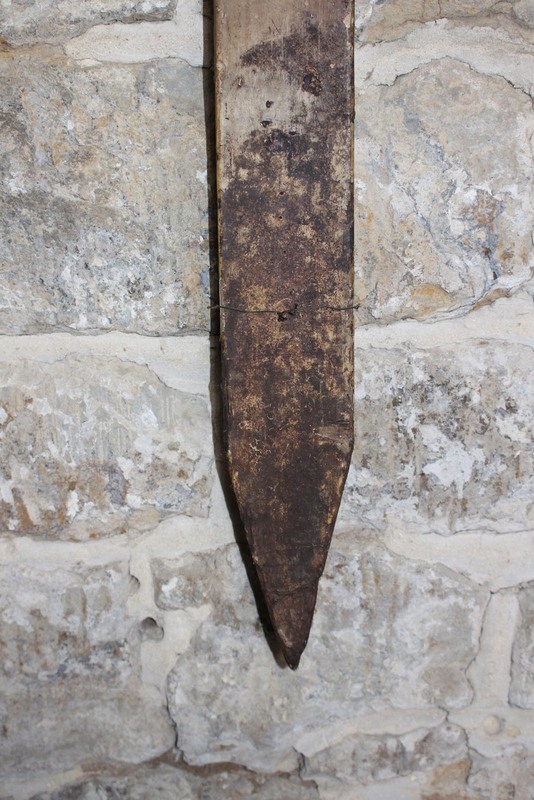 Mounting : Hung on wall, small circular bracket fixed to roughly cut top. Wire loop attached (to attach wreath). Detailing: Half lap joint, fairly roughly cut and damaged. No decoration. Evidence of use in field: Rot damage at top? 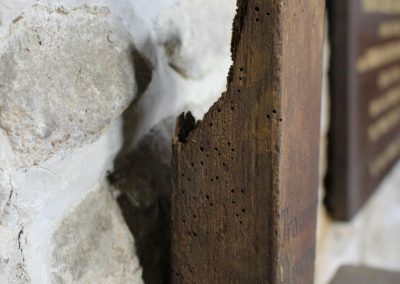 Evidence of woodworm. Surface insertion depth : No clear evidence of insertion but slight darkening at base. 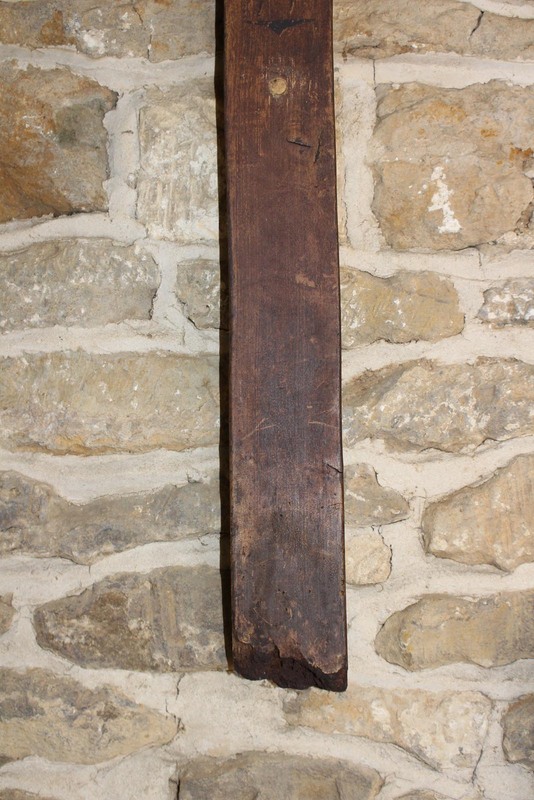 Finish : Dark wood, possibly stained or treated after recovery. Text difficult to read. Condition : Some splitting. Rot damage at top? 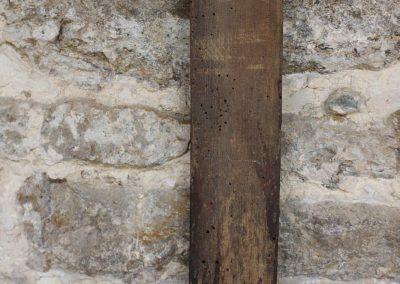 Evidence of woodworm. 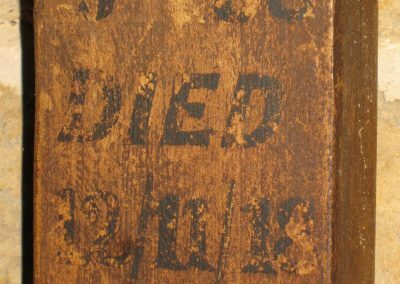 Text has an unusual, thick, intaglio appearance. 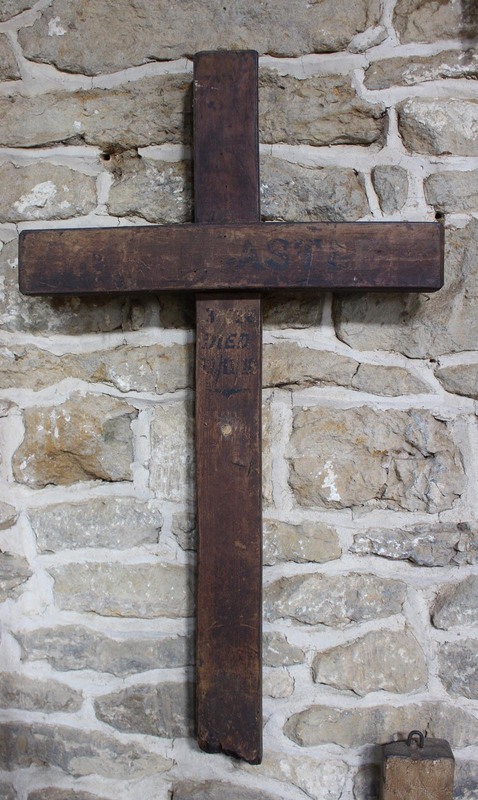 A similar effect noted on the cross of W D Hancox, also at this church, recovered from a different place. 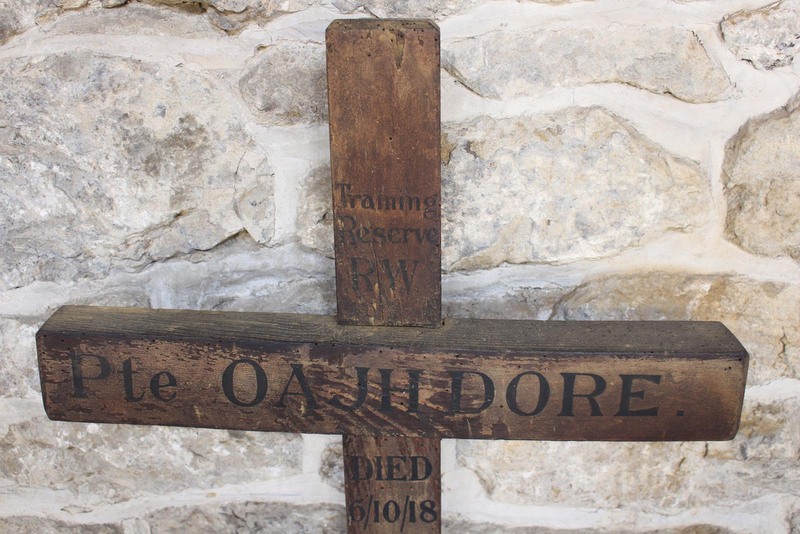 “In the afternoon orders were received that a very strong patrol was to be sent out to capture RAINY trench an isolated trench about 400 yds in front of our line and on the s.side of the LESBOEUFS – LE TRANSLOY road…..
From CWGC the casualties for 29th/30th September were: L/Sjt. T. G. Smith, Pte A. Phillips, Pte R. F. Bishop and Pte. Tustain. Born: Diddington, Oxon (sic). Enlisted: London. Residence: Queensland, Australia. 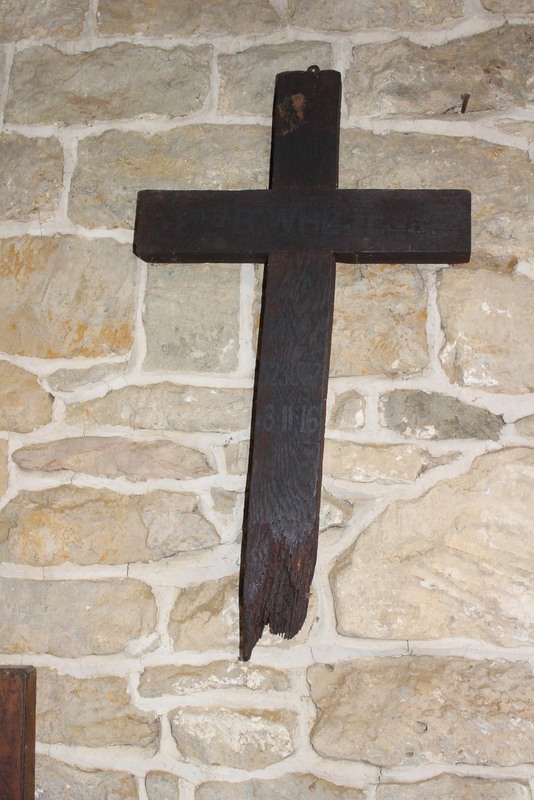 Landed in France 3rd February 1915. The medal rolls Gives name as Frederick T. Tustain. No additional details in the rolls. The 1st Bn war diary seems to be missing. Private 6633 Tustain, F. T. No 3 Coy 1st Battalion. Coldstream Guards. 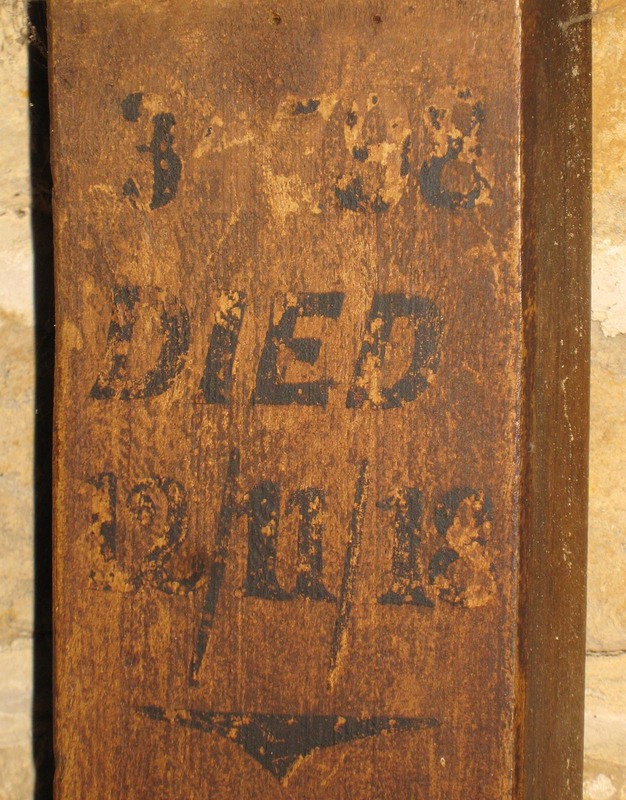 Date of death 29/9/1916, Age 30. 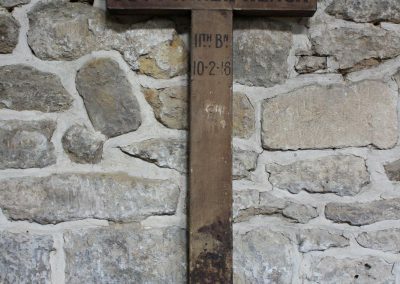 Buried at Guard’s Cemetery, Lesboeufs, grave number 1B. ZZ. 4. 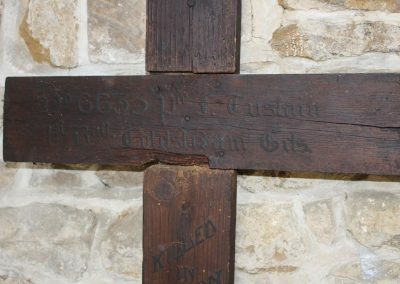 Frederick Tustain is not living with the family at Deddington in 1901 or 1911 (He may have left for Australia in 1911). 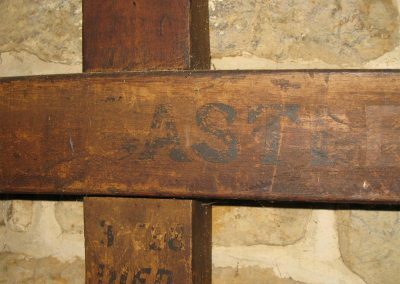 There is a Frederick Tustain, living in the parish of St Luke, Old Street London in 1901, age is given as 17, born Deddington, Oxon, occupation Draper’s Porter. Fredk. Tustain, age 25, departed London on “SS Kaikoura” on 9th August 1911, arrived at Brisbane 24th September 1911. The entire passenger list seem to be Railway Workers (labourers). Mounting : Fixed to wall. Detailing: Half lap joint is not flush. Evidence of use in field : As below. Surface insertion depth : Not apparent. Possibly broken off. Finish : Painted white/light colour. 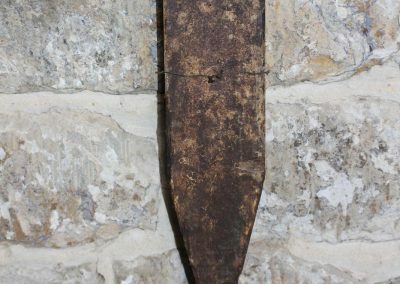 Condition: Faded , discoloured paint, Lettering faded, base rotted. 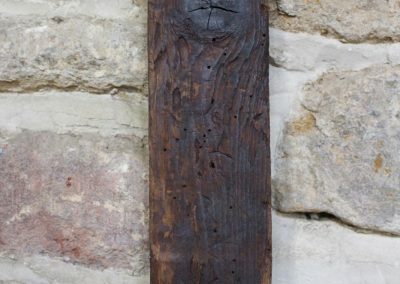 Trace of woodworm. 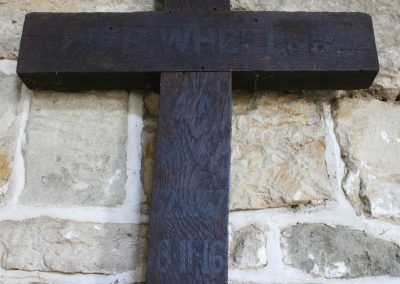 Similar construction and lettering to the crosses to Pte. Dore and Pte. Ell, also in this church yard. Private 24522 A. J. 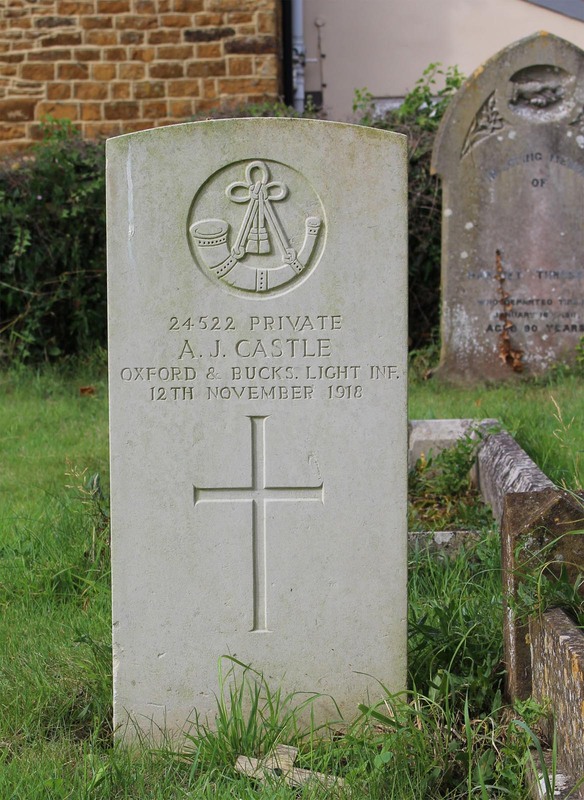 Castle, Oxford and Bucks Light Infantry. Transferred to 134798 Labour Corps. 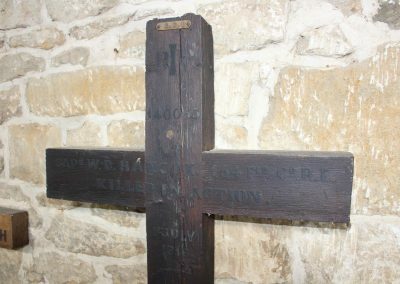 Buried at Deddington, St Peter and St. Paul Churchyard. Died at Beaufort War Hospital, Bristol, age 31. Son of Alfred M. and Mary J. Castle, of Clifton. Husband of Mary Augustus Castle, of Clifton. PTE O A J H DORE. Text type : Black hand written. 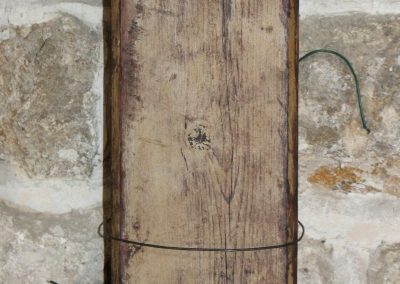 Mounting to wall: Hanging on wall. Detailing: Half lap joint is not flush. 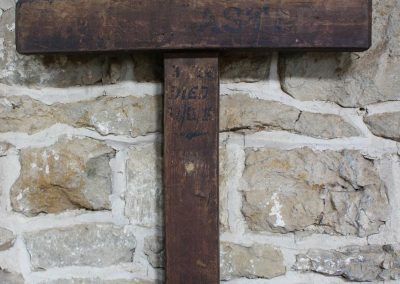 Chamfered ends to shaft and cross beam. 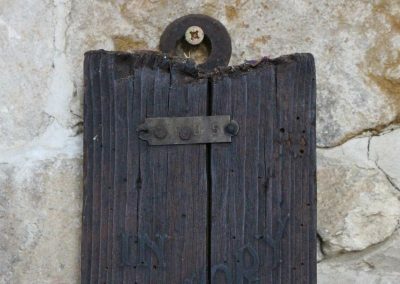 Evidence of use in field: Faded paintwork. Finish : White/light painted, faded and weathered. 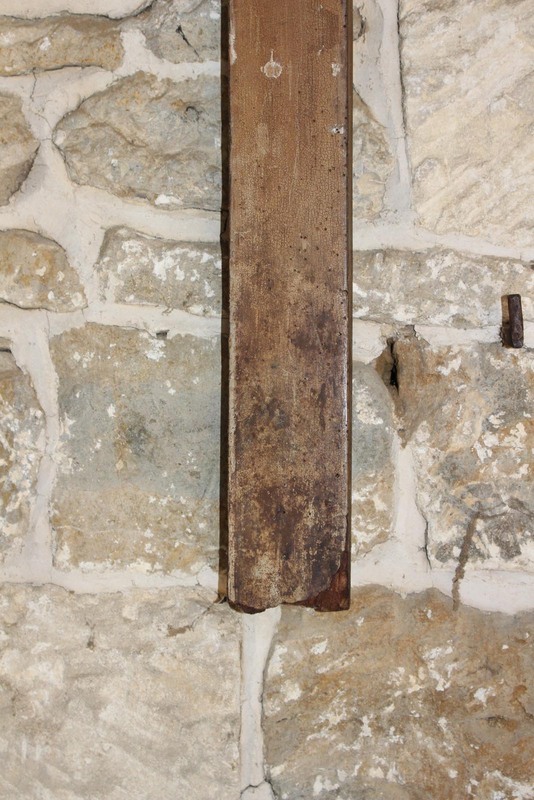 Condition : Wood decay upper and especially lower shaft, possible broken off. 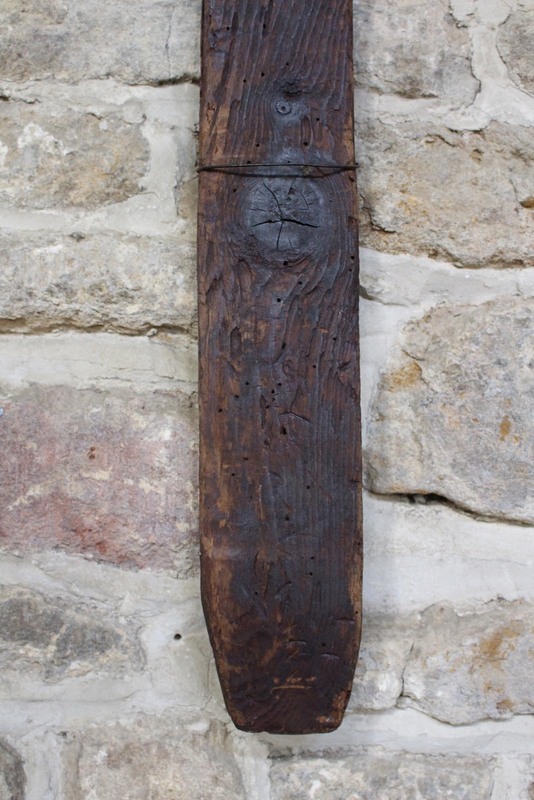 Some woodworm. 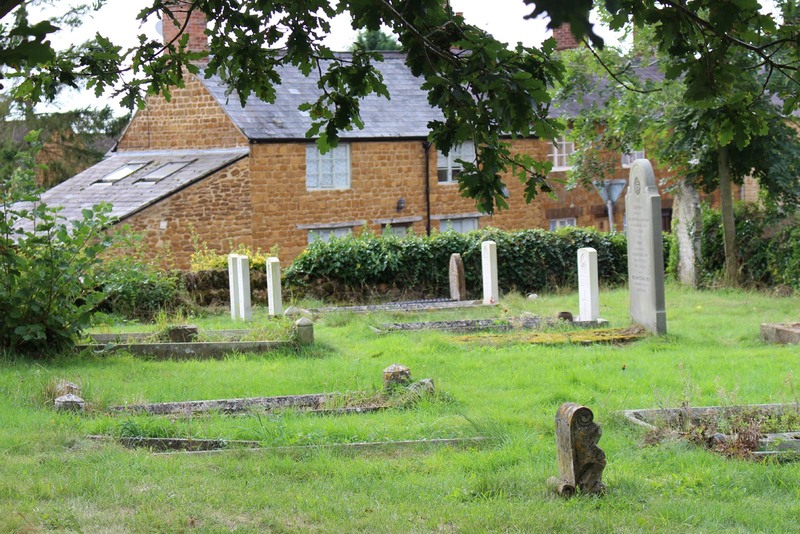 Local burial in Deddington church yard. 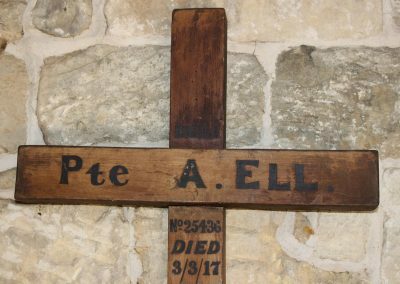 Similar style to Pte Ell. 53rd Bn TR/7/28029 Royal Warwickshire Regiment. Age 18. 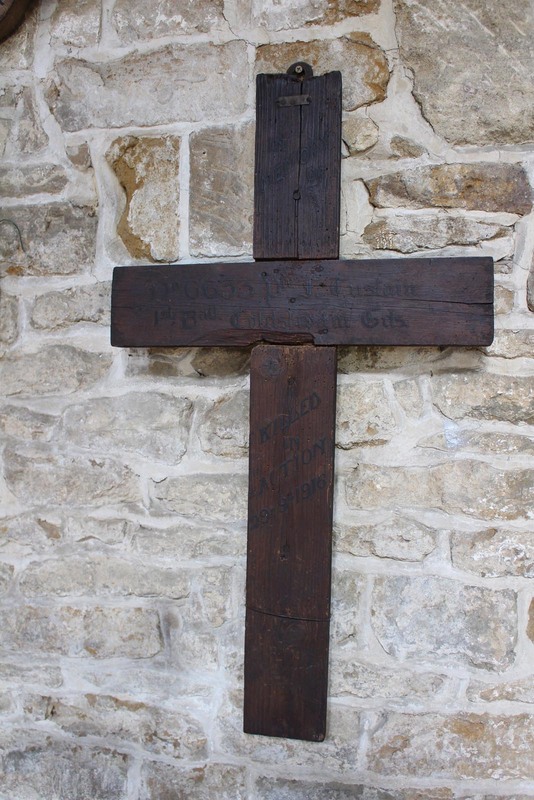 Son of Arthur George and Rosina Dore, of Victoria Terrace, Deddington. 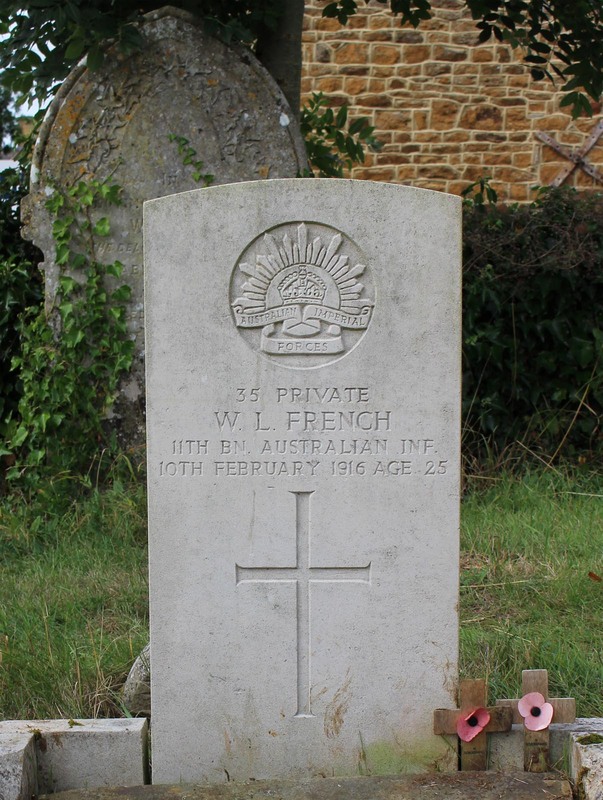 Died of pneumonia in Luggershall, Suffolk, where the regiment were stationed. 53 (Graduated Battalion) Royal Warwickshire Regiment. Text type (e.g. hand-written, GRU tags, carved): Black hand written. 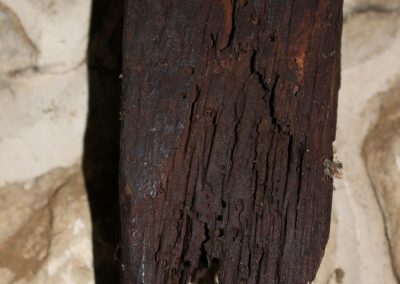 Evidence of use in field : Staining to base. Some rot. Finish : Original white/light paint or stain faded. Condition : Rot at base. 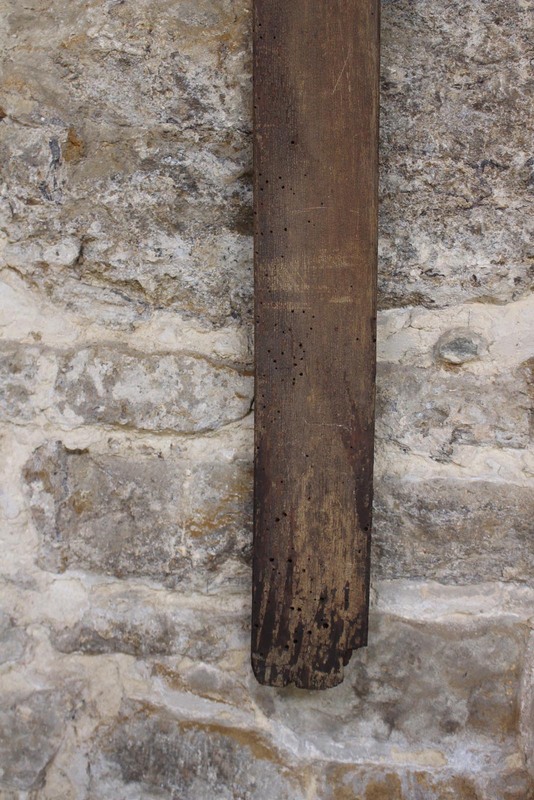 Some woodworm. 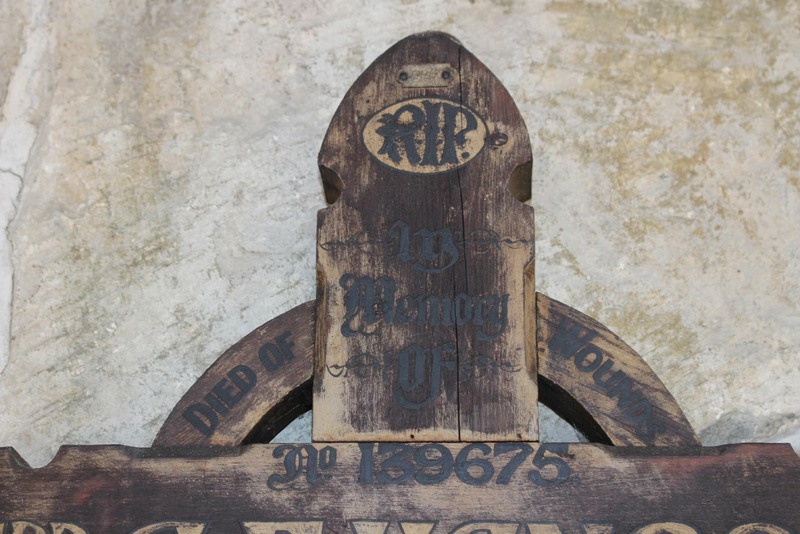 Local burial in Deddington church yard. Similar style to Pte Dore. Born Deddington, Oxford. Enlisted Oxford. Residence Deddington. 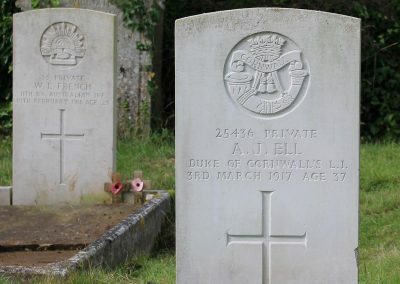 Private 25436 Ell, Alfred John. 12th Battalion Duke of Cornwall’s Light Infantry. Date of death 03/03/1917 age 37. 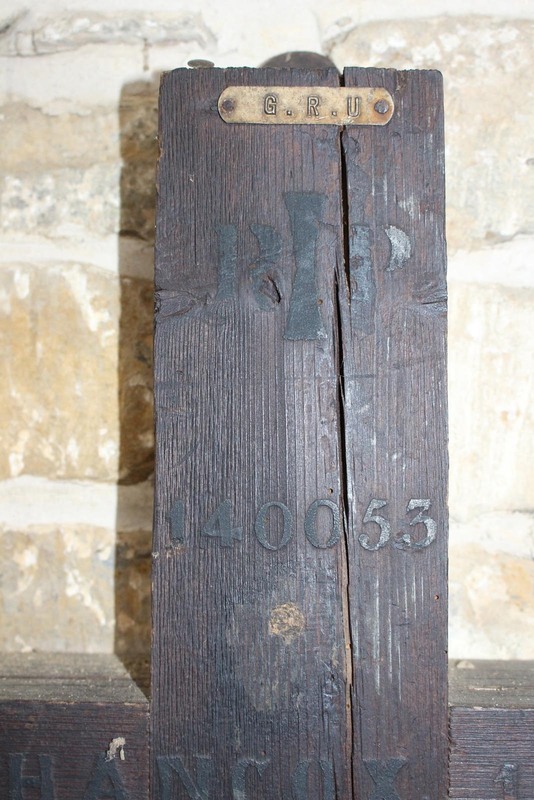 Buried at Deddington St. Peter and St,. Paul Churchyard. 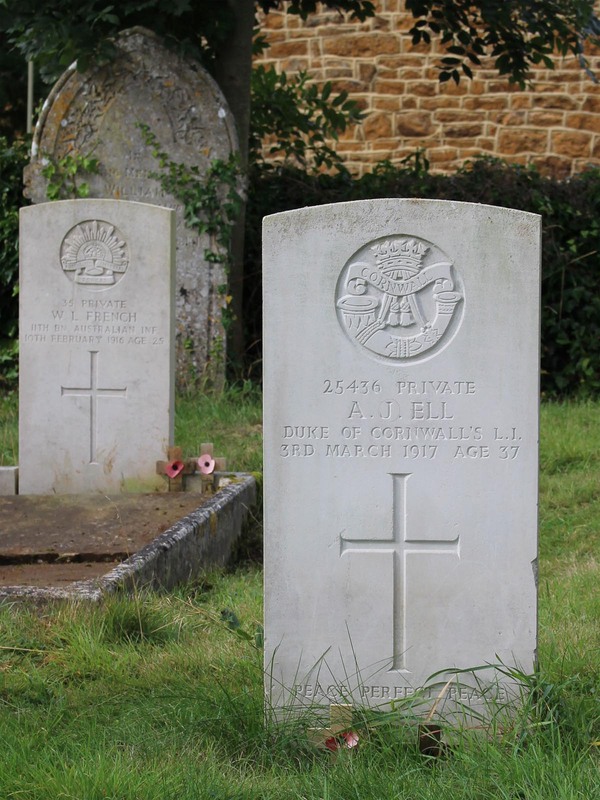 Son of George Alfred and Frances Ell, of New Wigginton, Banbury. Born at Deddington. In 1911 a Jobbing Gardener, living with his aunt Jane Ell, Market Place, Deddington. In the Soldier’s Effects Register, she is the sole legatee to receive the War Gratuity payment.. Cause of death is given there as died of wounds. (in hospital at Chichester). Text type : Hand written black text. Mounting: Screwed to wall. Unused staple on top of shaft. Wire loop attached (to attach wreath). Detailing: Base of shaft tapered on all 4 sides. 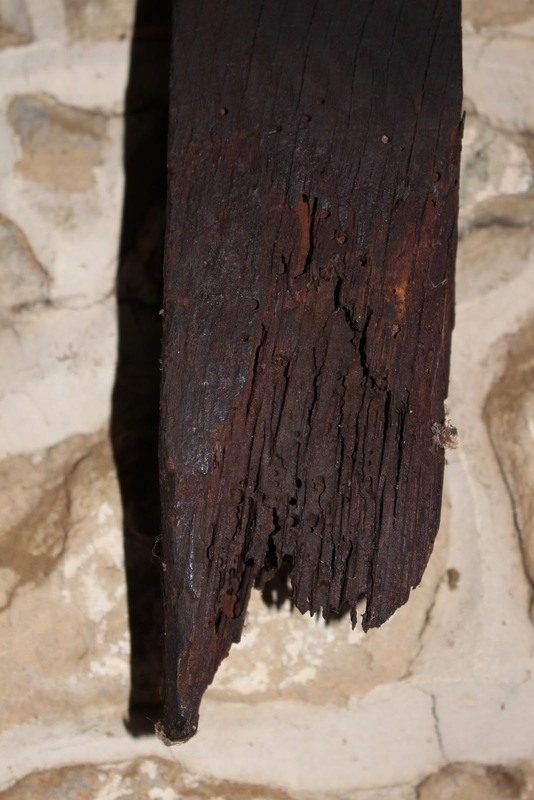 Evidence of use in field: Discoloured lower part of shaft. Finish : Faded white/light paint. Condition: Paint discoloured. Slightly crazed. From 1911 census: Living at 51 Kenilworth Street, Leamington, as a border. Trade given as Butcher’s Apprentice. Parents living at Deddington with son John Maurice and daughters Gladys Emily and Madge. 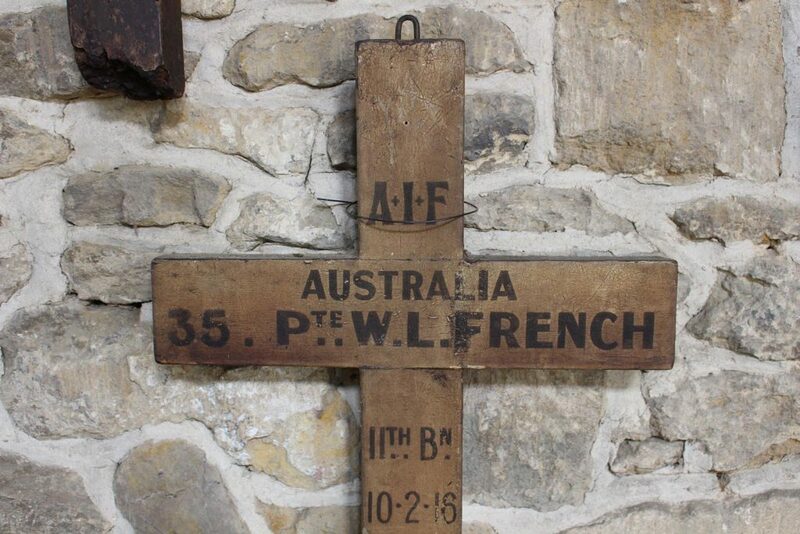 No 35 Private William Loder French, 11th battalion Australian Infantry A.I.F. Died 10th February 1916, age 25. 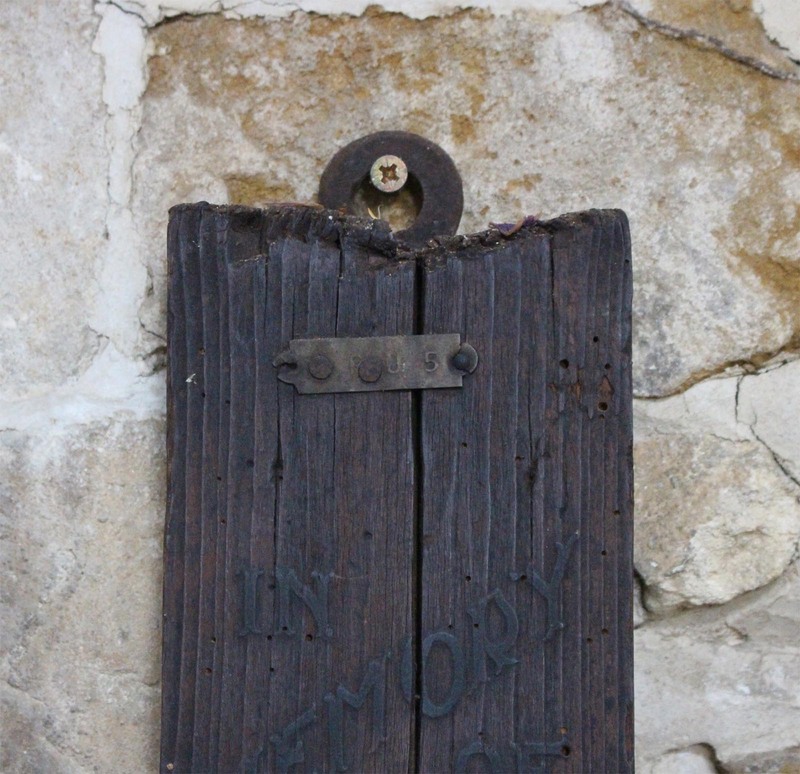 Buried at St Peter and St Paul Churchyard, Deddington. 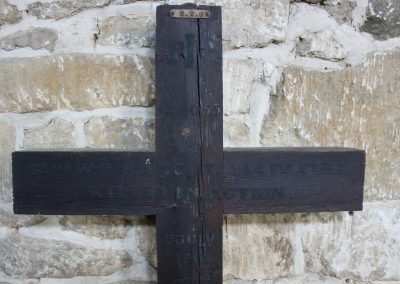 Son of William Joseph and Emily French, of Council St., Deddington. 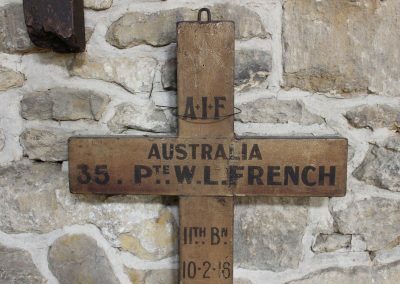 From AIF service record: Born 1892 at Deddington, Oxfordshire. Enlisted in the Australian Imperial Forces, 11th Battalion on 21st August 1914, in Western Australia. His trade is gives as butcher. Height 5 ft 9, weight 148 lbs. Previously served 4 years in the 20th Hussars. Embarked on HMT Suffolk to Alexandria to join M.E.F. (Gallipoli campaign), 2nd March 1915. 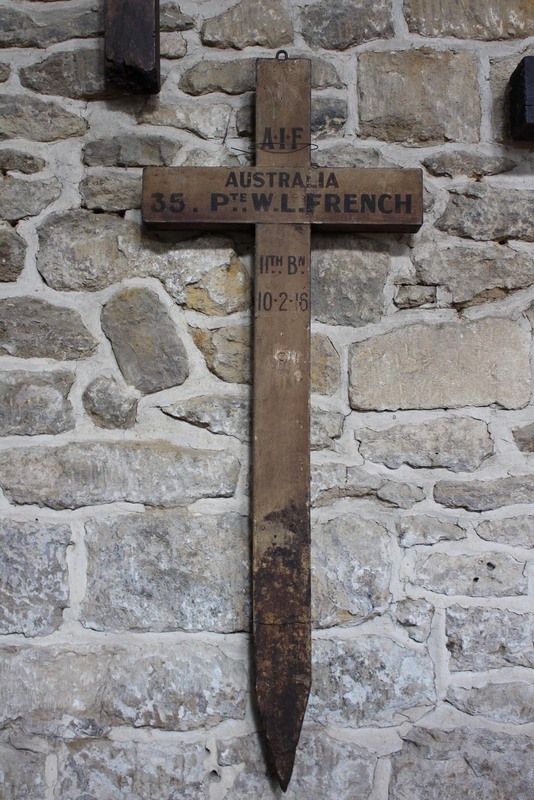 Admitted to 1st ANZAC Casualty Clearing Station, 25th July 1915, with dysentery. Transferred to Lemnos on HMTS Neuralia on 29th July 1917. Disembarked Alexandria 4th August. To 2nd General Australian Hospital, Ghezireh. 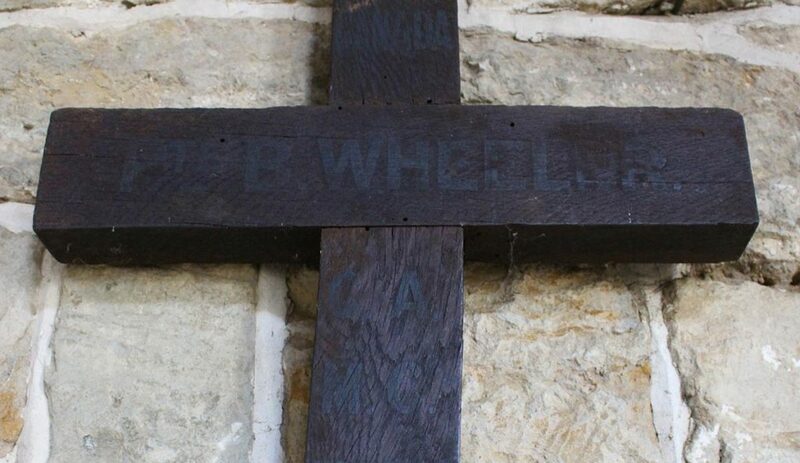 Invalided to England on 23 September 1915 and admitted to Reading War Hospital, 5th October 1915. Died at home at Deddington on 10th February 1915 of cerebro spinal fever. Evidence of use in field : Base rotted. Surface insertion depth; Base missing, broken off. Finish: Dark stain. 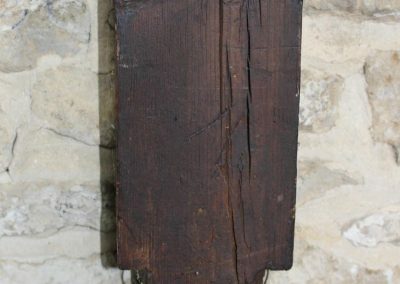 Presumed to have been treated with stain after recovery. Condition : Shaft broken off at base. Text difficult to read and mounted high on wall. 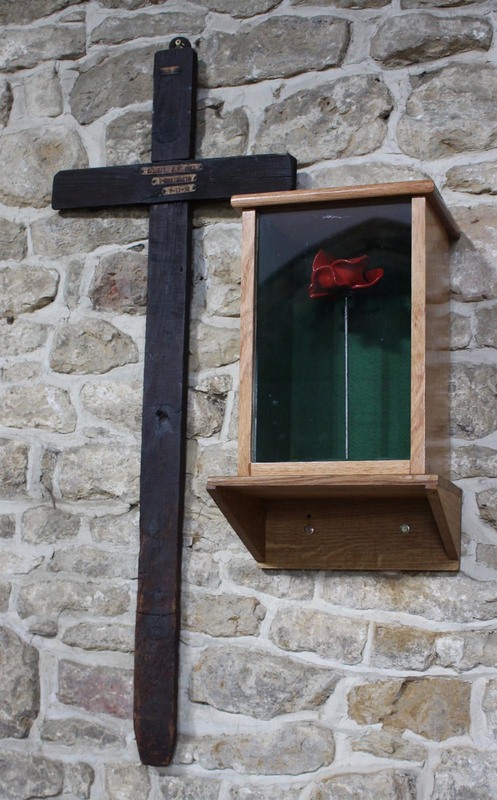 From A Parish at War, by Michael Allbrook and Robert Forsyth. 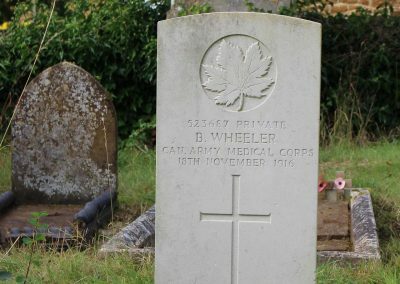 Private 823687 Bernard Wheeler, Canadian Army Medical Corp. Training School. Died on the 18th November 1916. 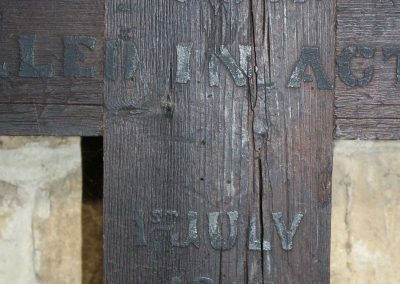 Buried at Deddington St. Peter and St. Paul Churchyard. 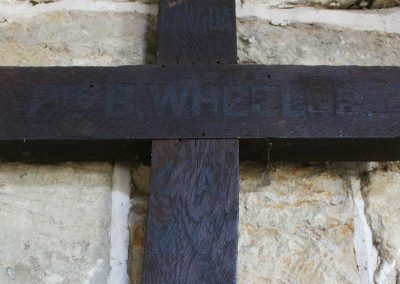 Son of James and Sarah Wheeler, of Deddington. 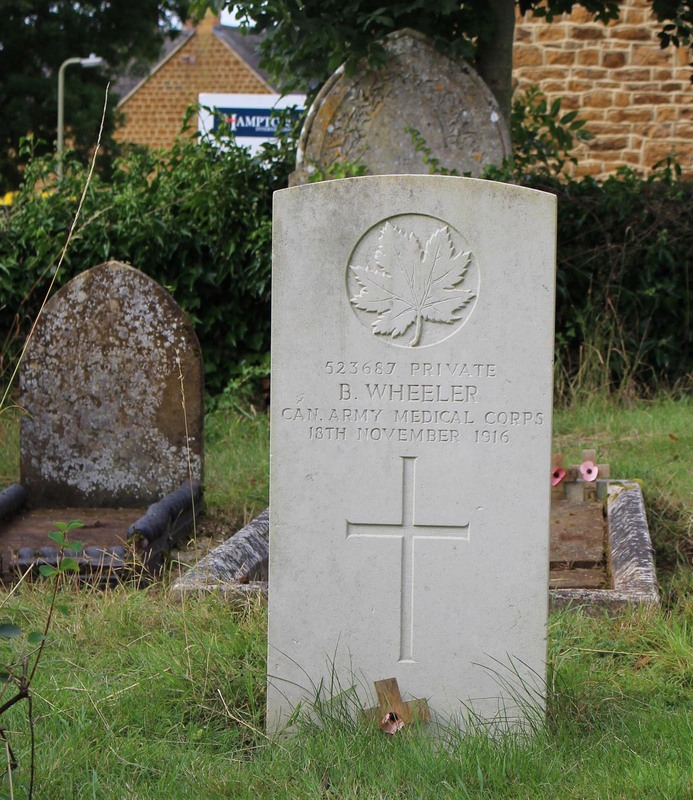 Husband of Janet Wheeler, of Winnipeg. Emigrated to Canada on 28th February 1907, on the SS “Southwark”, to Novia Scotia. 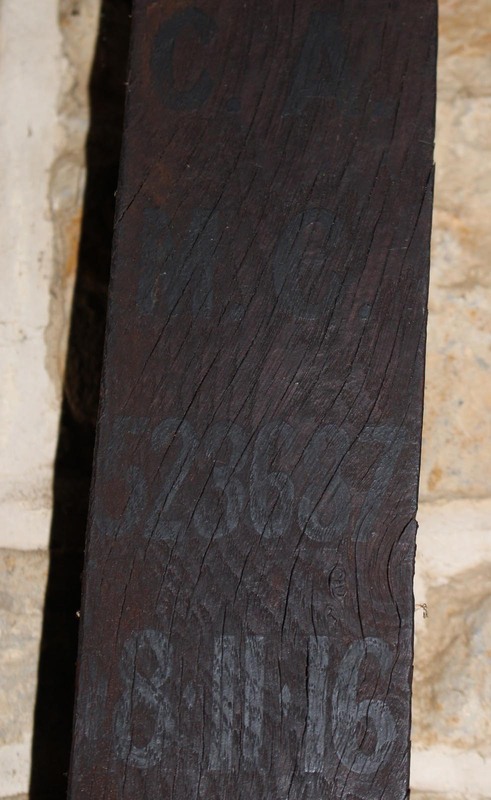 Born 8th March 1886, at Deddington. Previous service with 100th Canadian Militia. Enlisted in the Canadian Expeditionary Force 21st February 1916. Age 26, height 5ft 6in, blue eyes, dark brown hair. My name is Ruth O’Quigley and my grandfather was Artur James Hancox who survived the war. I have all the details about the 4 sons and all their war medals and photos. 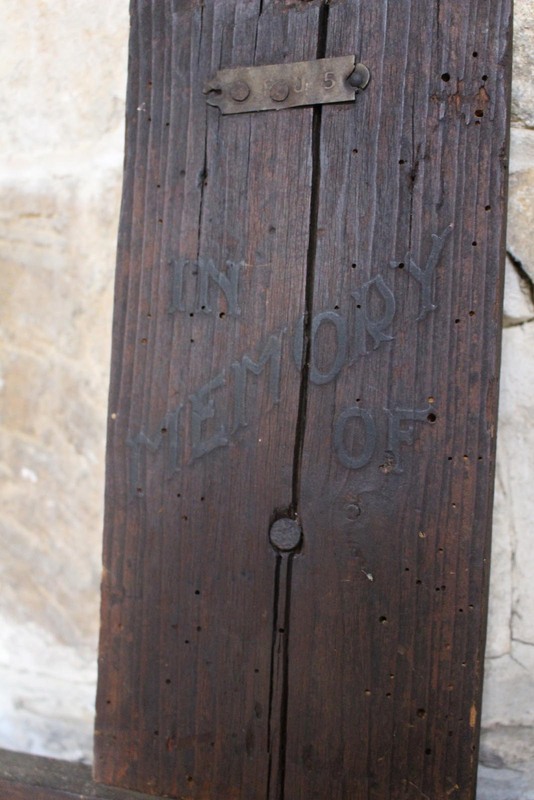 In 1920 their father hand carved the oak memorial which is hanging in the church. 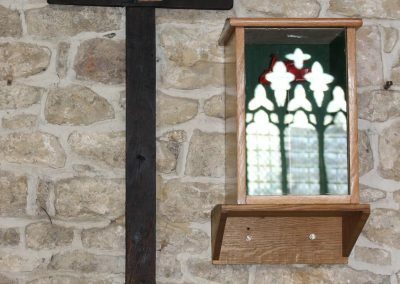 We have replaced the plaque with a second revised version containing the name on the piece of stone on the shelf in your image. Can I supply the revised image? email me to get your address and I can send it. 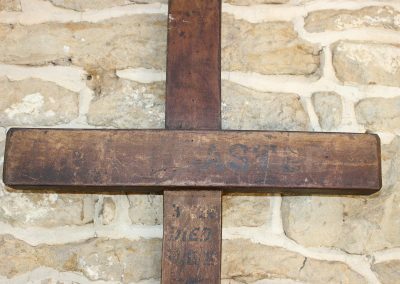 In my earlier comment I should perhaps have made clear I am referring to Oxfordshire Deddington Church St Peter & St Paul. 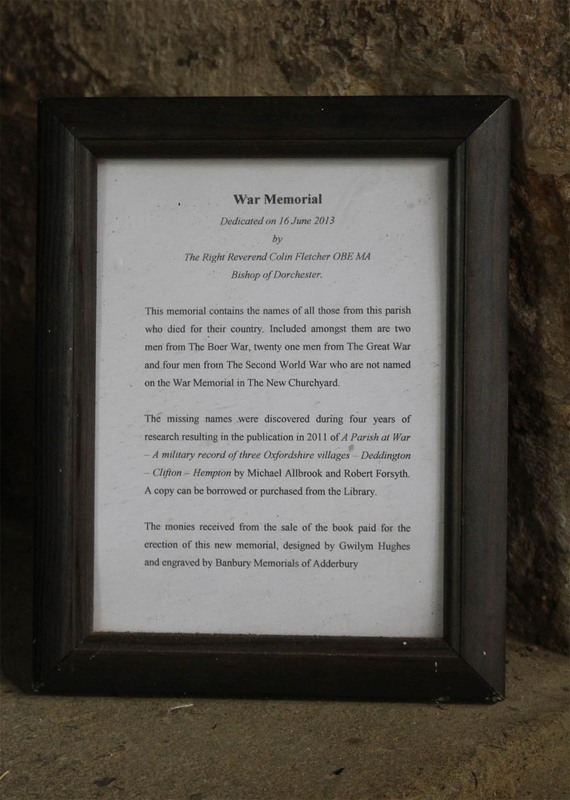 and the Plaque at the foot of the page with a wreath hanging off it. 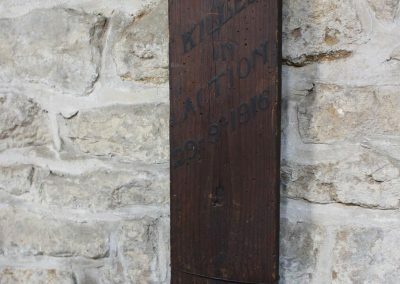 The plaque has been replaced with a new one similar in appearance incorporating the missing name Jarrett F and correcting the spelling of Thatchell (Boer War) to Satchell.